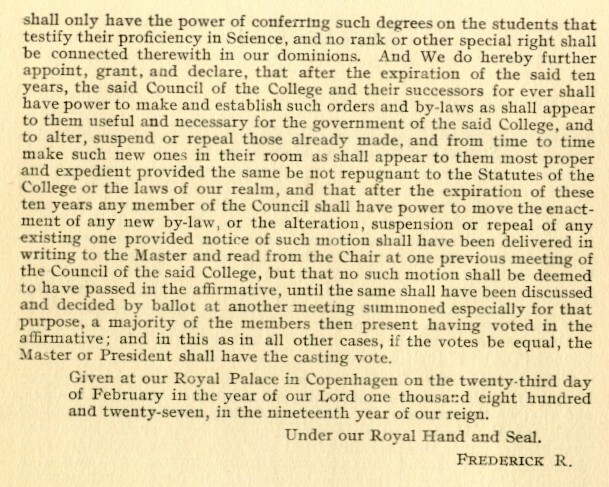 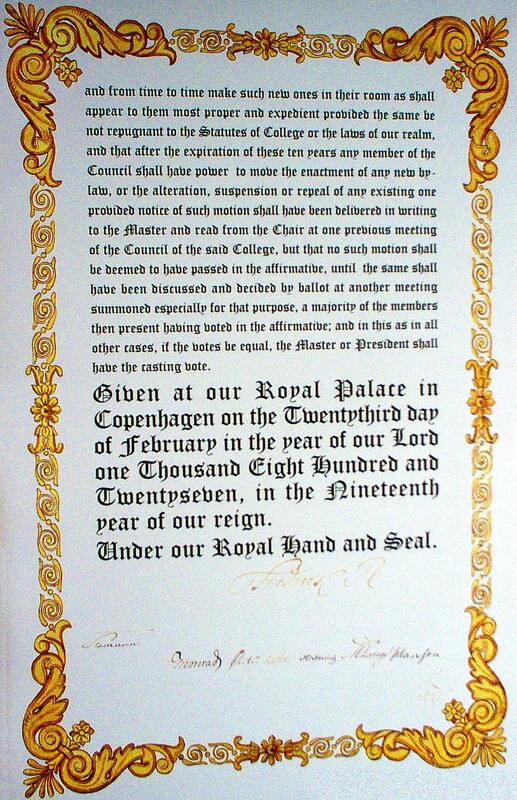 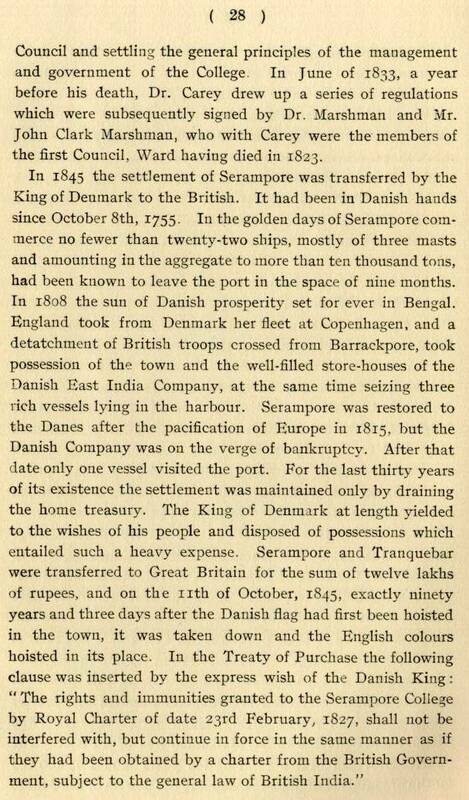 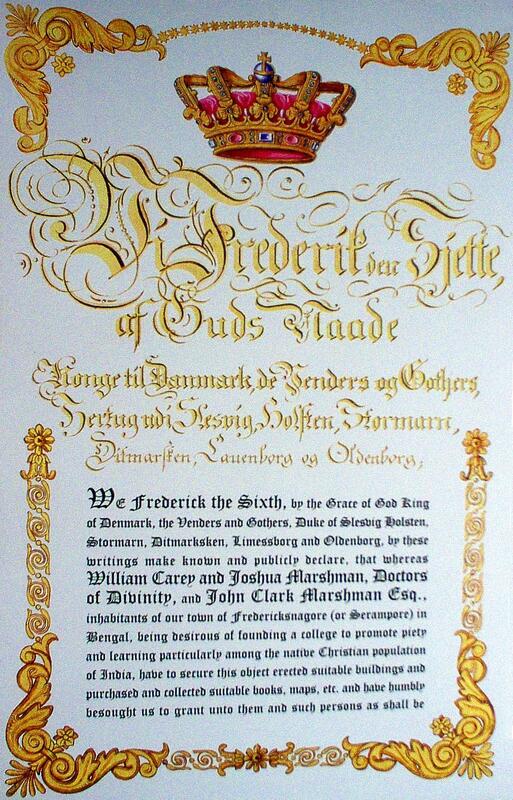 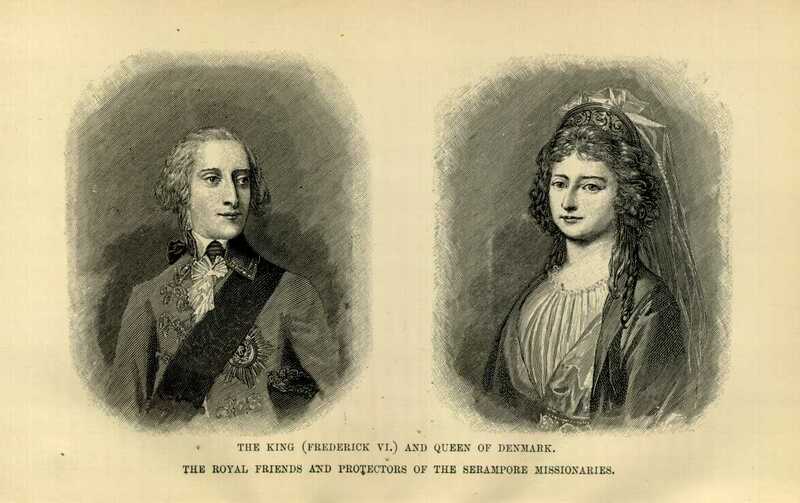 Since Serampore was a Danish colony, Frederick the Sixth, King of Denmark, issued Serampore College its Royal Charter of Incorporation on February 23, 1827, in Copenhagen, Denmark (Charter, 1, Charter, 2, Charter, 3). 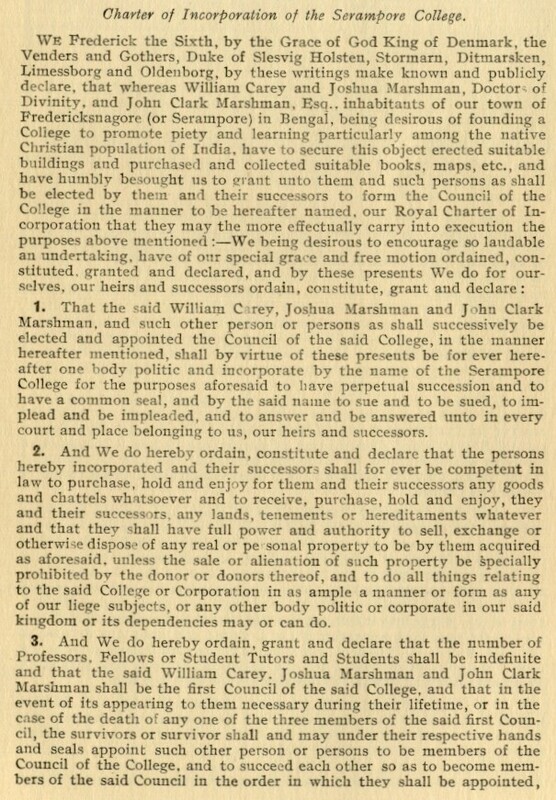 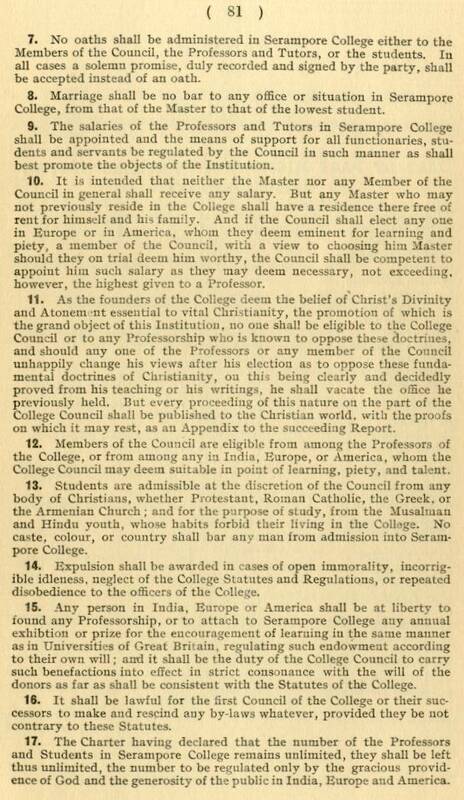 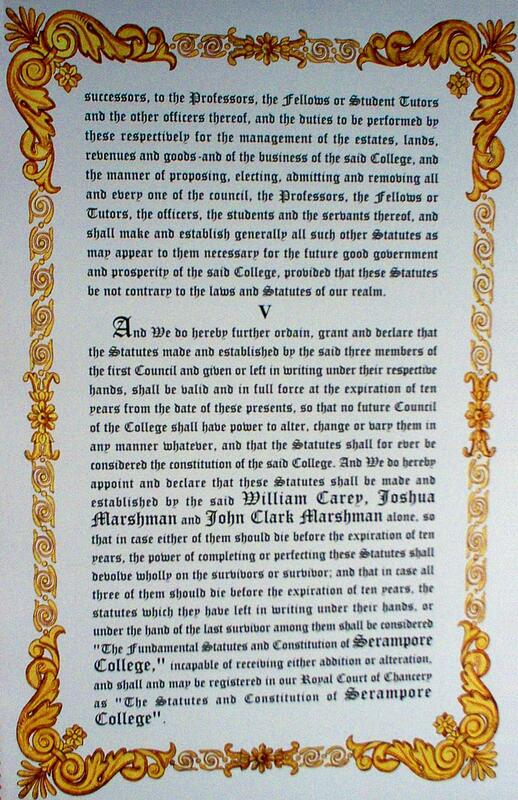 The charter came in response to Joshua Marshman's visit with King Frederick in August 1826; the charter gave Serampore College the privilege of awarding degrees in Arts and Theology. 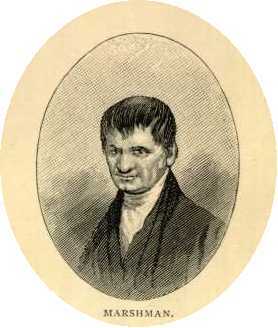 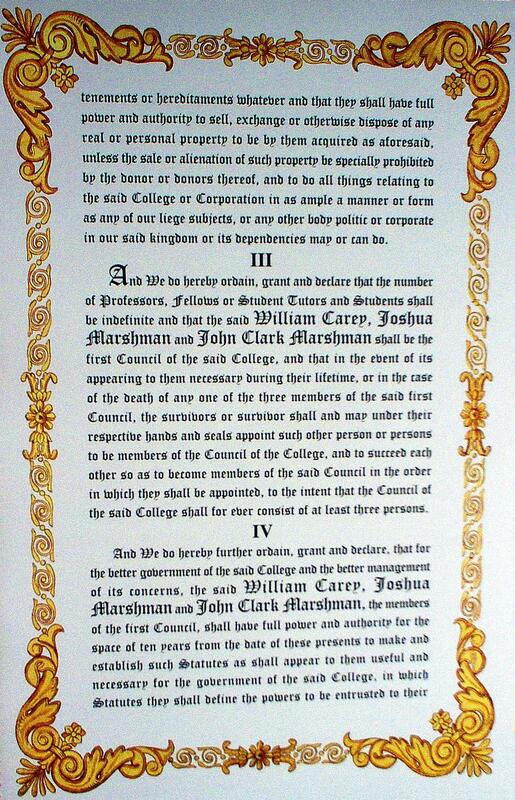 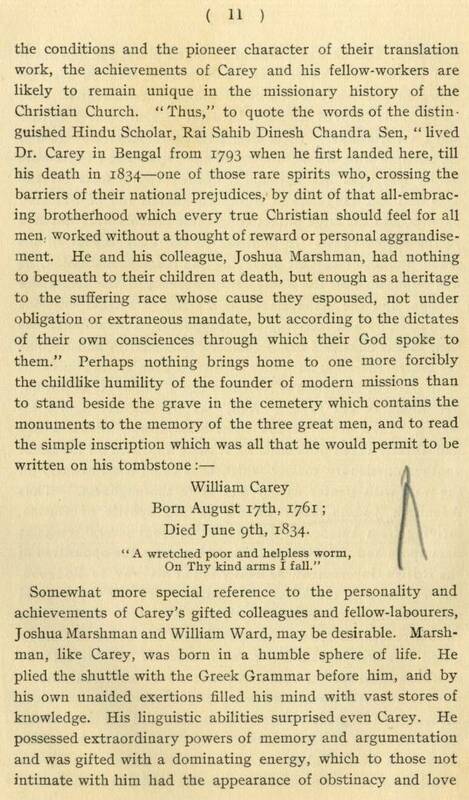 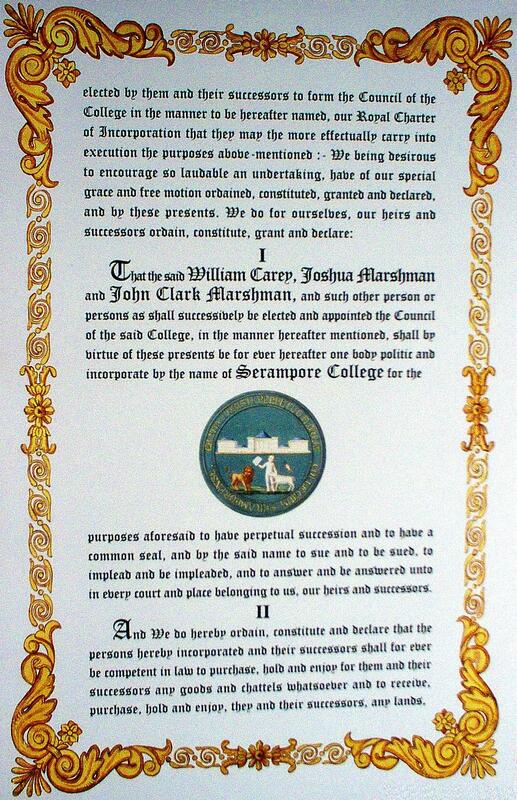 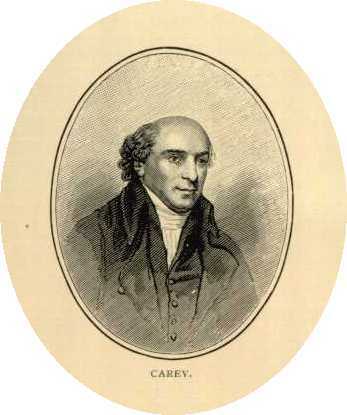 William Carey, Joshua Marshman, and John Clark Marshman (Joshua's son) were designated as members of the first Council. 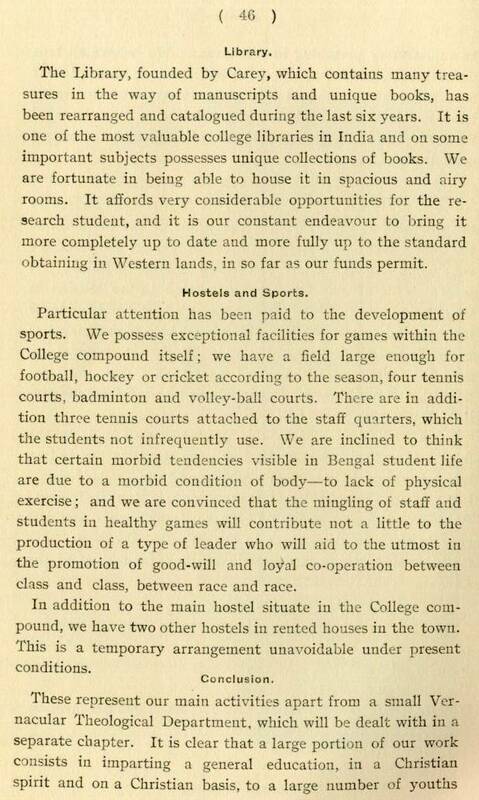 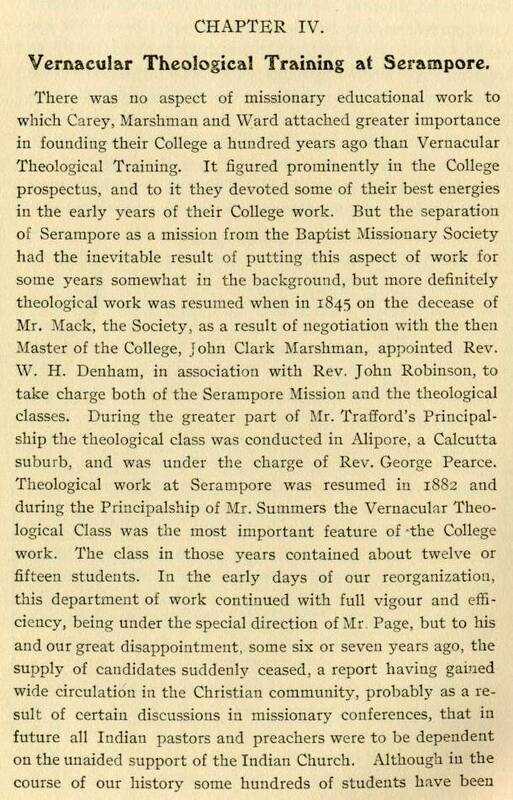 For the College's third report on its progress, 1829, click here. 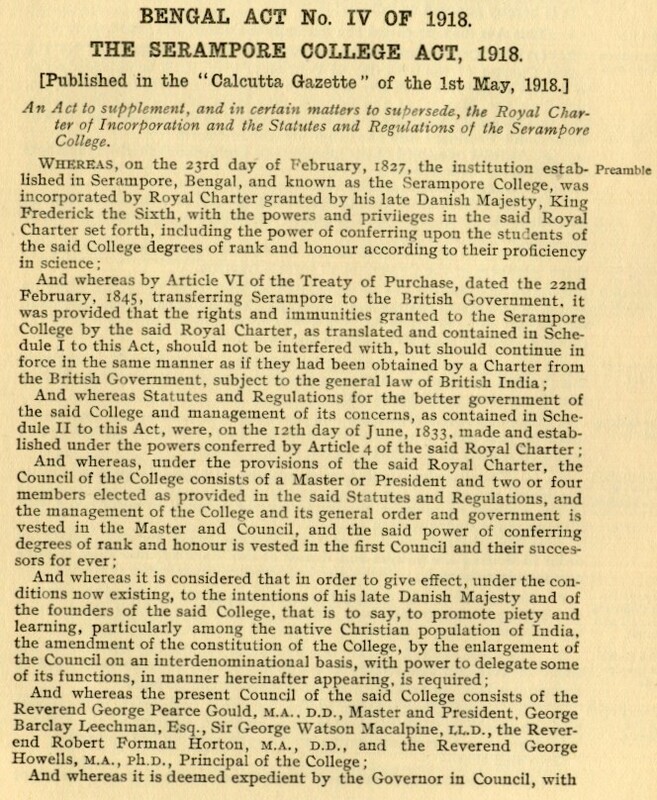 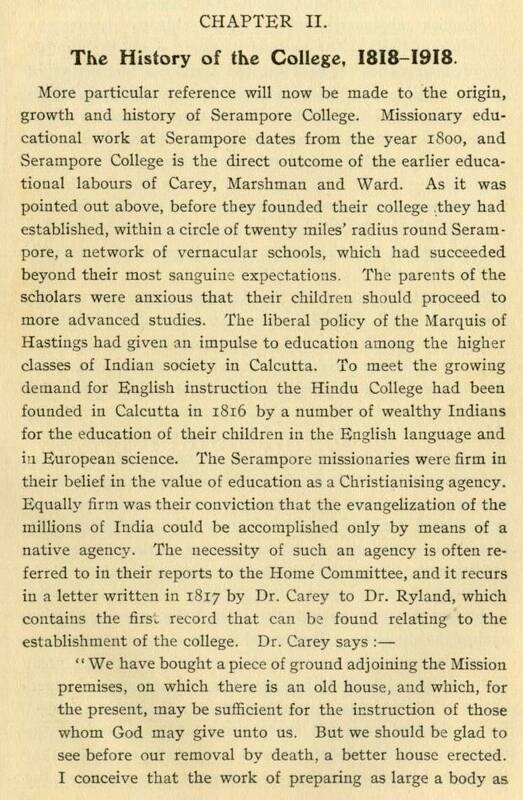 On February 22, 1845, the ownership of Serampore College was transferred to the British Government after Denmark sold all of its Indian assets to Great Britain. 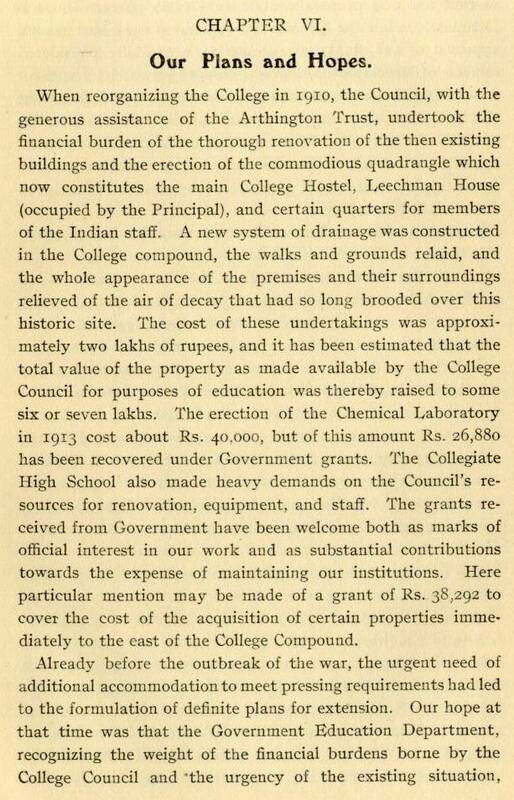 The management and operation of the College continued without interruption under the direction of a Master and Council. 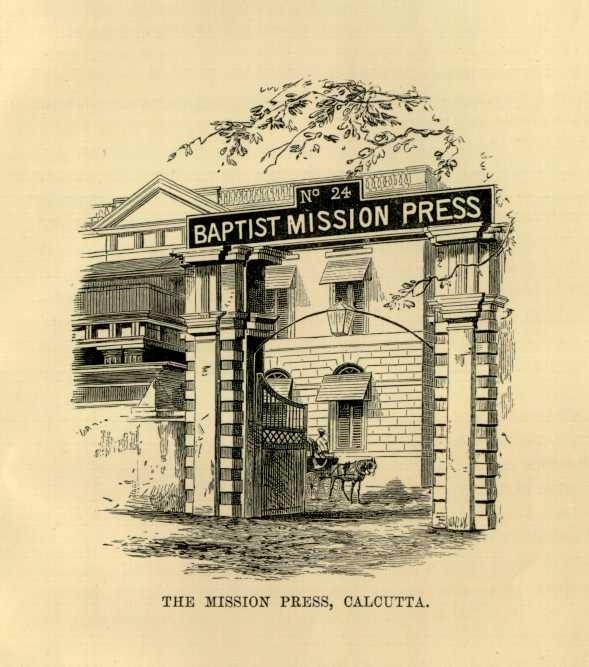 In 1856, the Baptist Missionary Society in England took over the management of the College, and in 1857, the College became affiliated with the University of Calcutta. 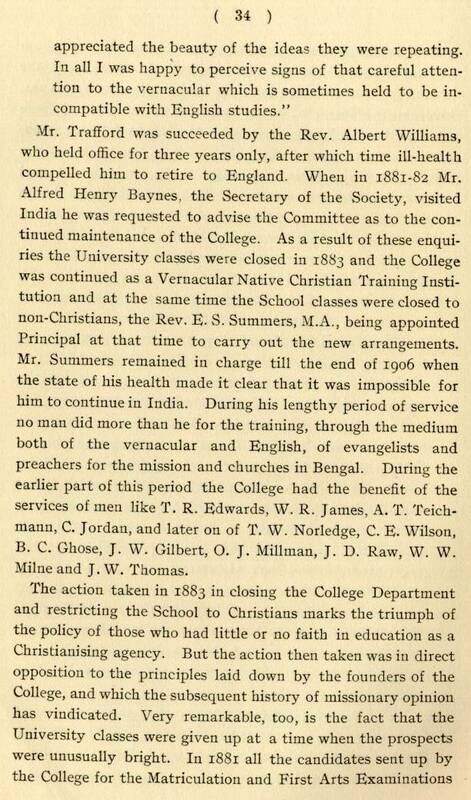 In 1883, the College closed as an Arts College and began functioning as a Christian Training Institution and a theological institute for the Baptist Churches in Bengal. 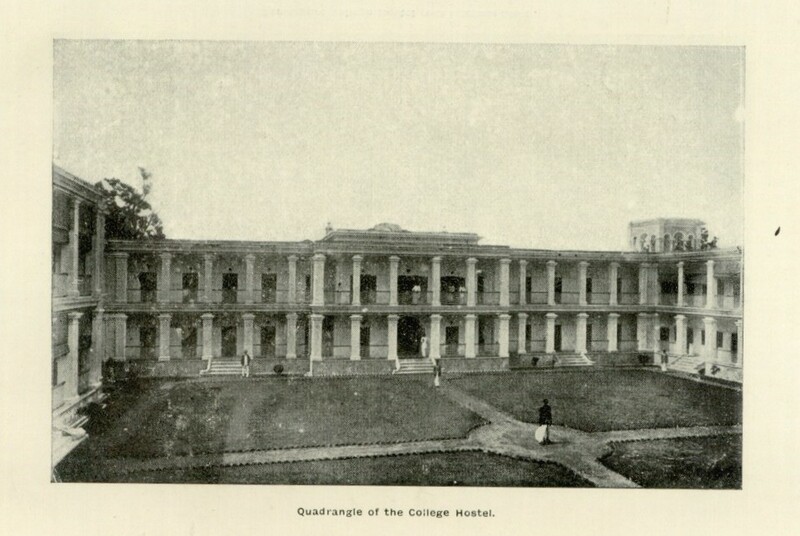 Affiliating again with the University of Calcutta in 1911, Serampore College, in 1913, rose to the standard of the Bachelor of Arts degree. 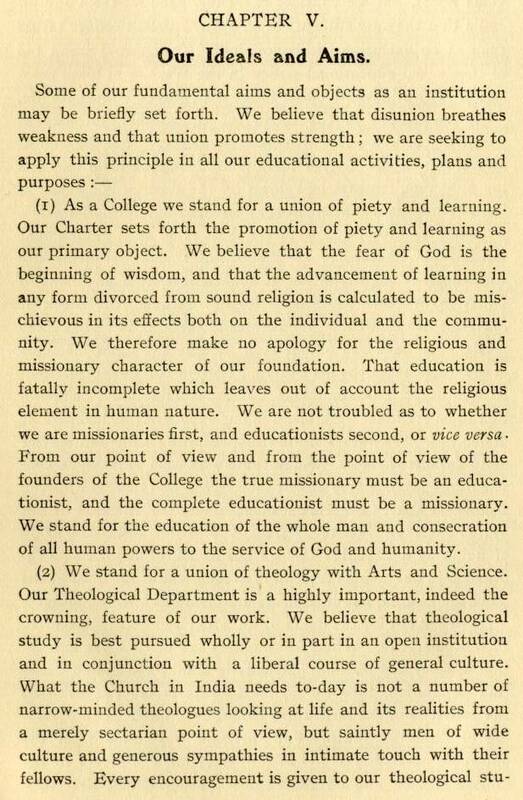 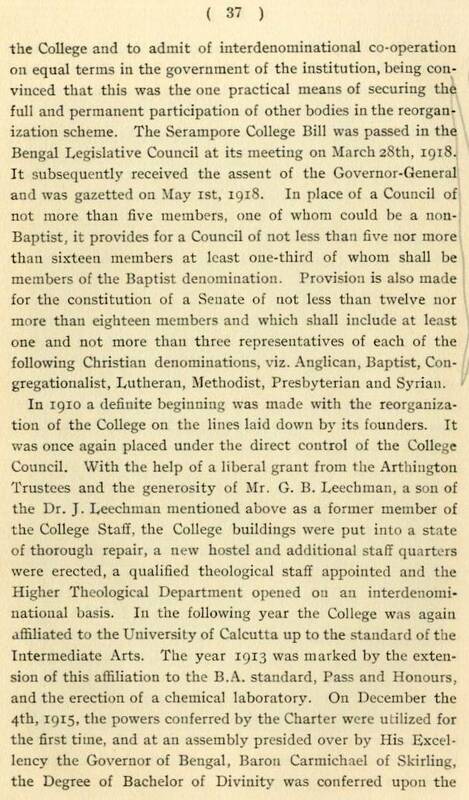 The College faculty was interdenominational. 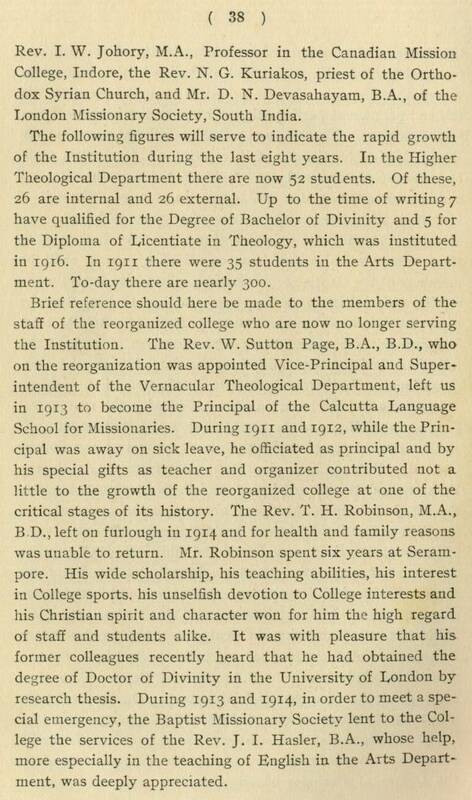 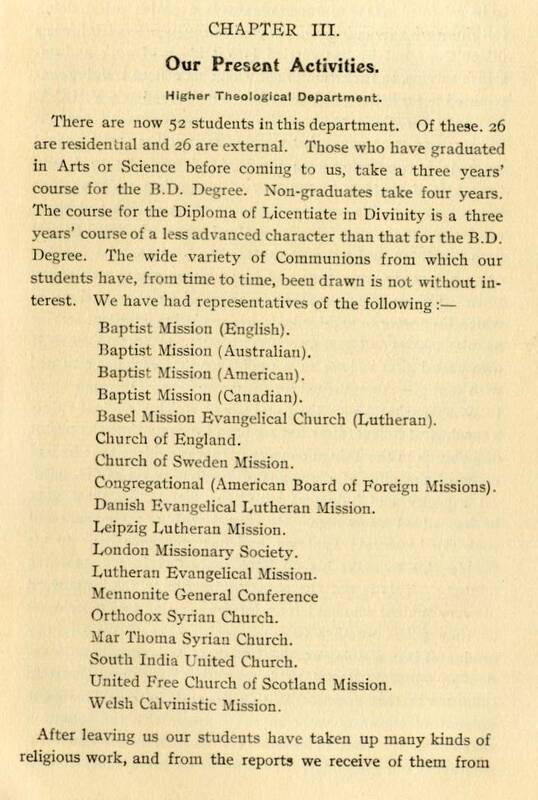 In December 4, 1915, the first group of Bachelor of Divinity students graduated: Rev. 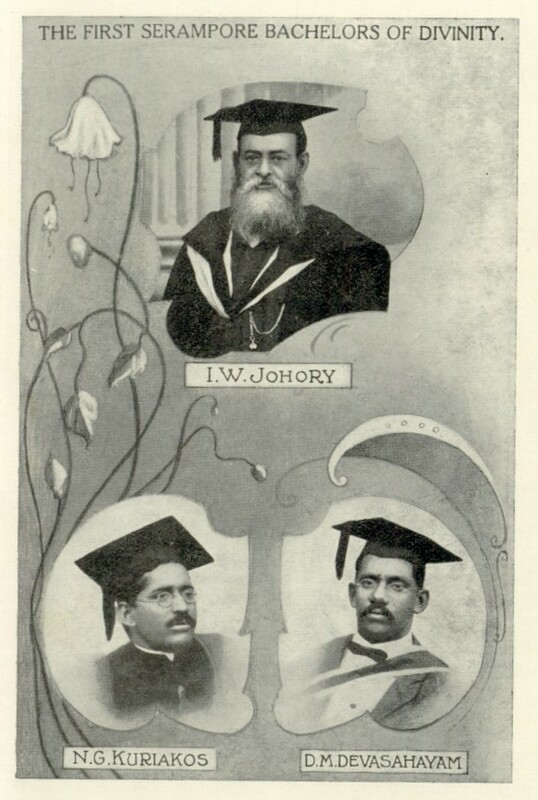 I. W. Johory, Professor in the Canadian Mission College, Indore; Rev. 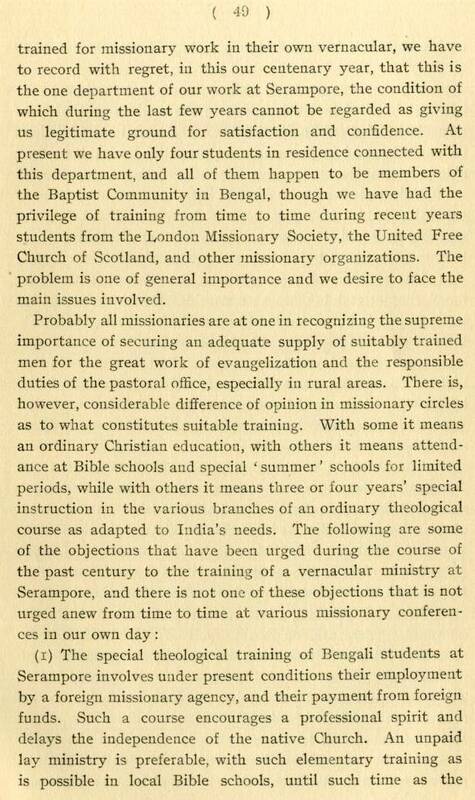 N. G. Kuriakos, a priest in the Orthodox Syrian Church; and Mr. D. M. Devasahayam, London Missionary Society, South India. 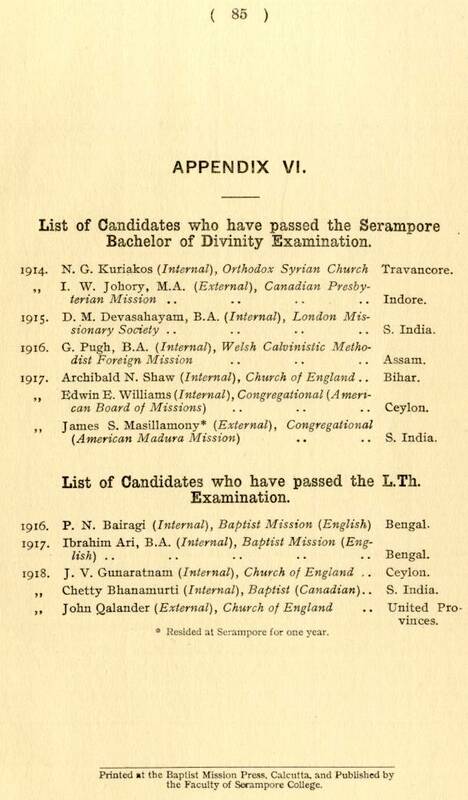 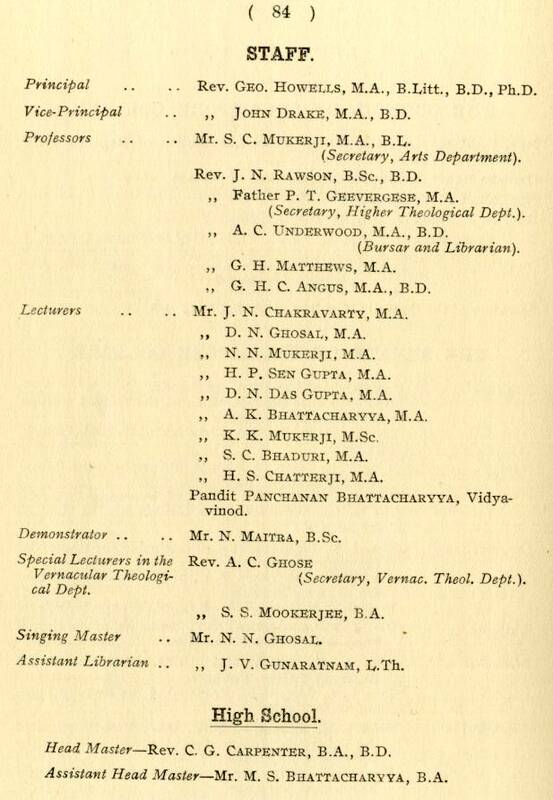 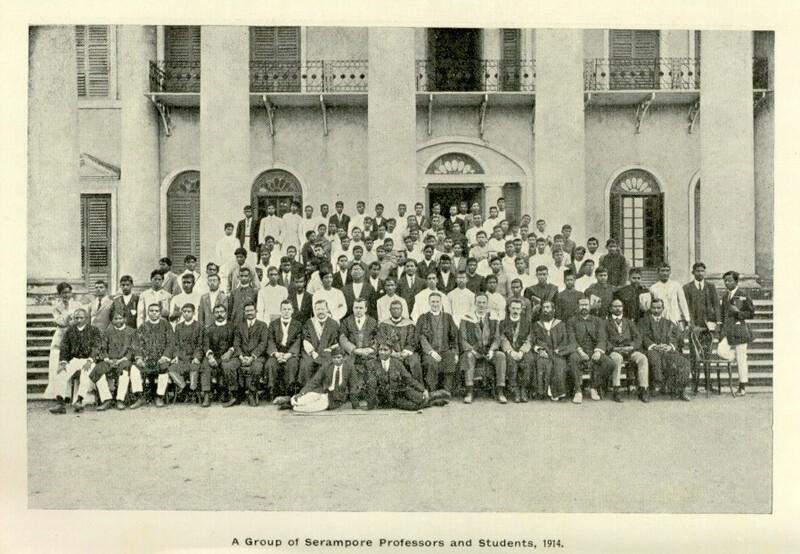 From 1916 through 1927, sixty-nine additional students earned the Bachelor of Divinity degree through Serampore. 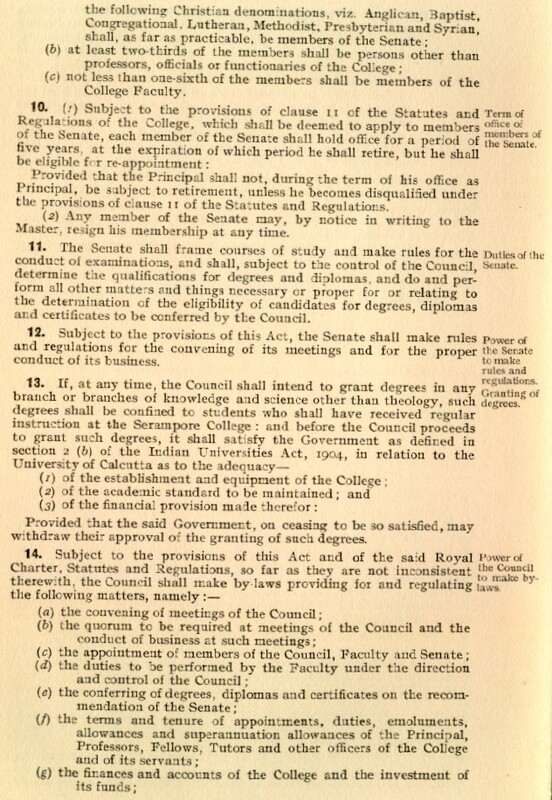 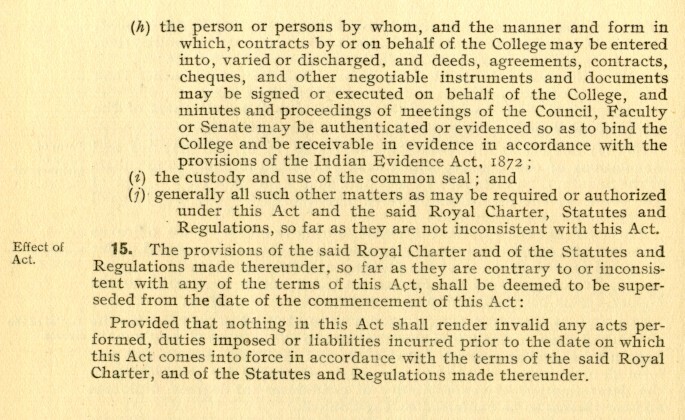 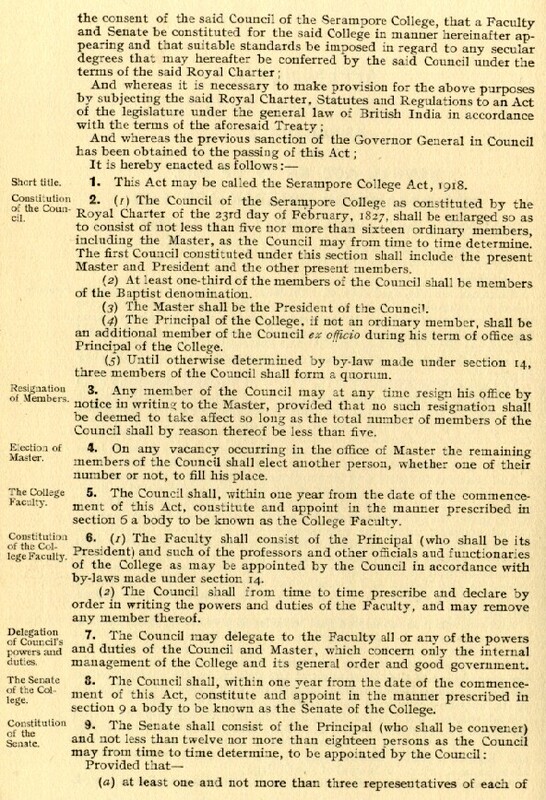 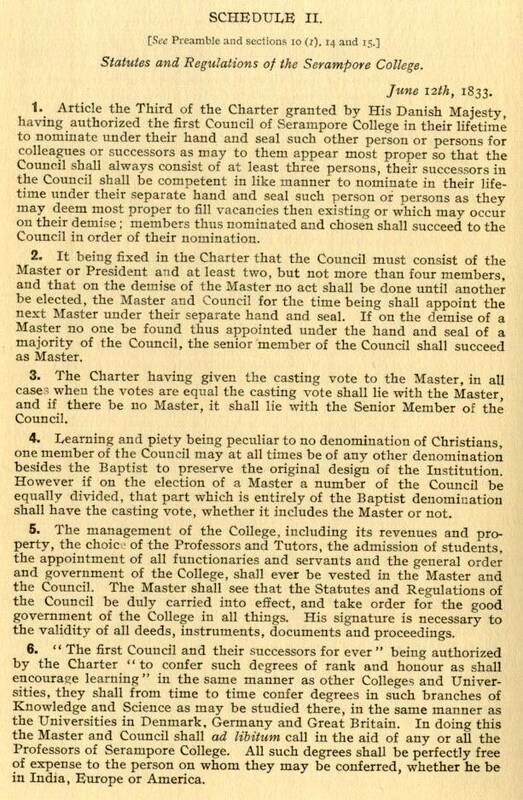 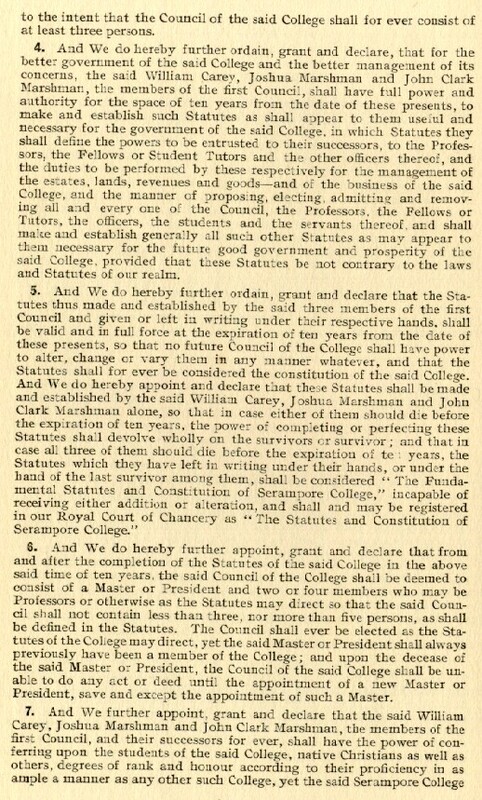 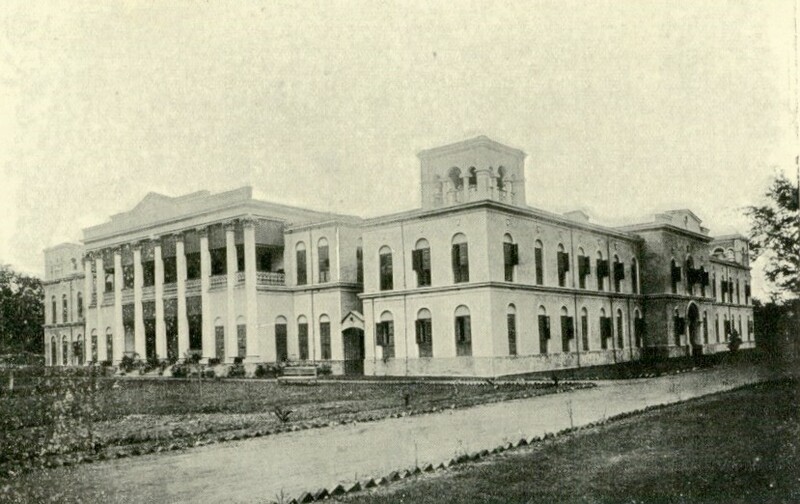 During the Centenary Year of the College in 1918, the Bengal Legislative Council passed the Serampore College Act (1918 Act, i, 1918 Act, ii, 1918 Act, iii, 1918 Act, iv) for the purpose of enlarging the College Council and forming a new interdenominational Senate that would confer theological degrees for all Christian denominations in India. 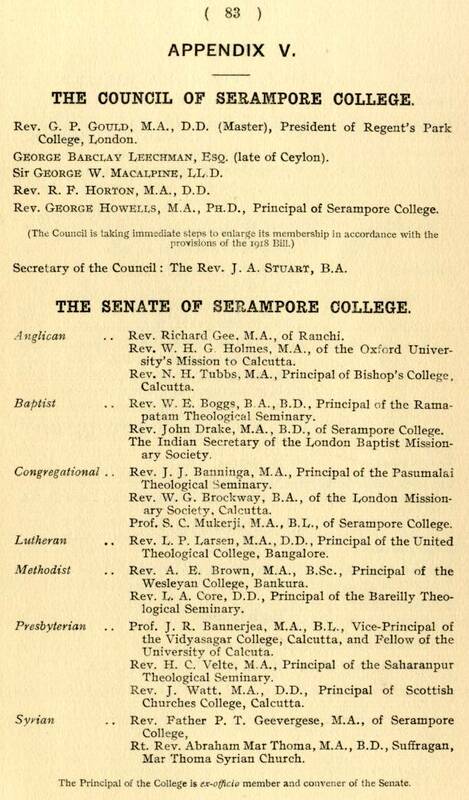 By 1960, twenty other Indian colleges and seminaries affiliated themselves with Serampore. 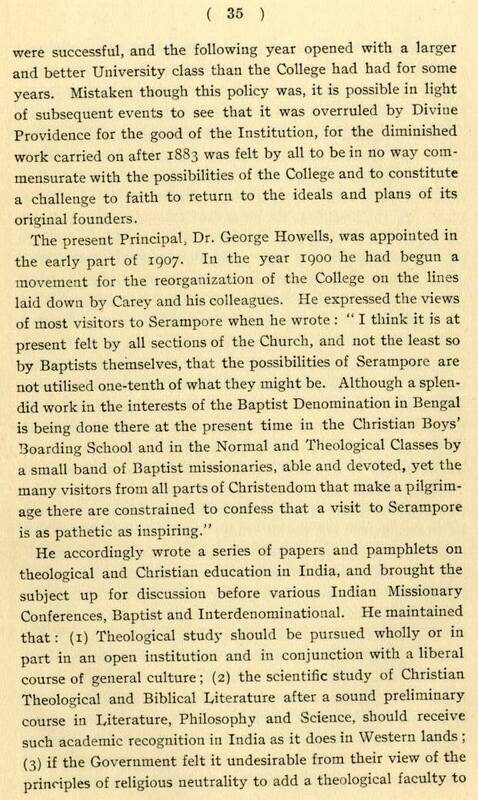 Dr. George Howells, one of two contributing authors of The Story of Serampore and Its College, served as principal of the Serampore College, 1906-1929, and came to be known as the "second founder of the College." 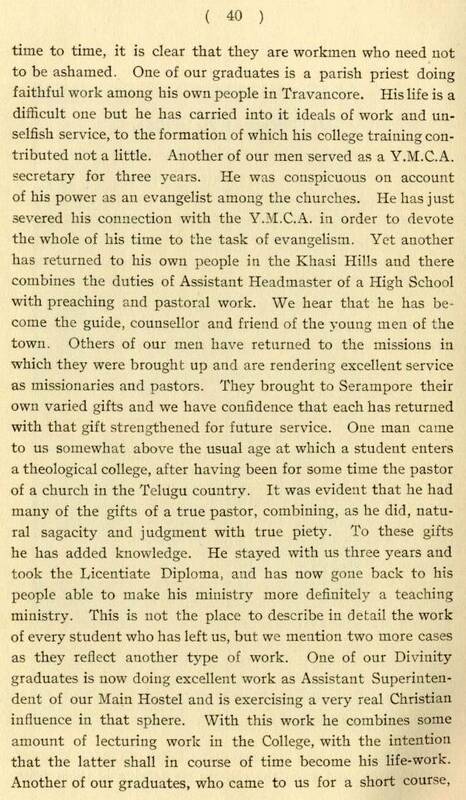 Howells had previously served as a member of the Baptist Missionary Staff in Orissa. 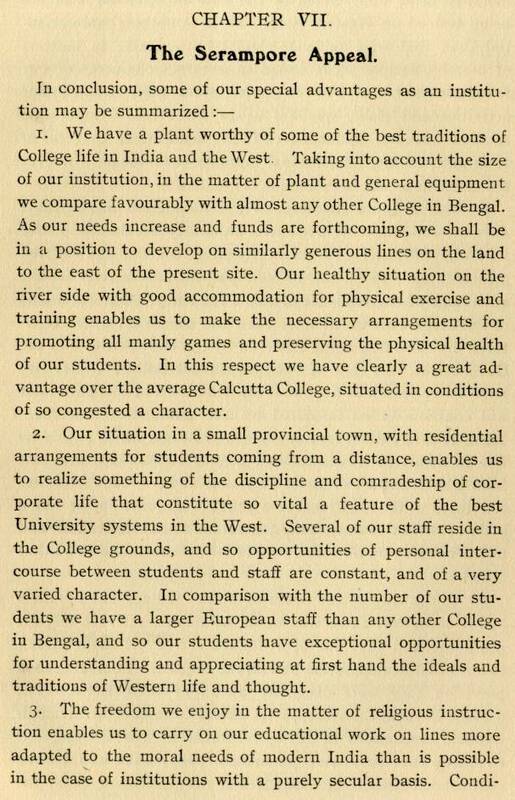 Under his leadership, Serampore College achieved the status of granting College degrees. 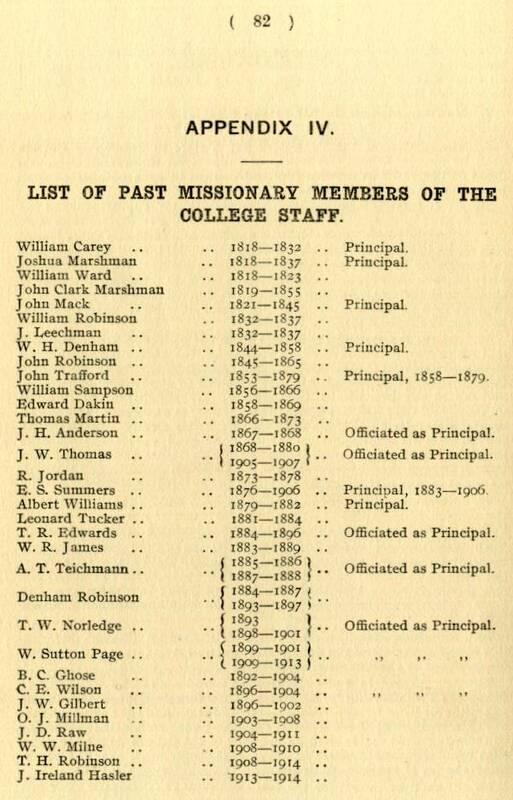 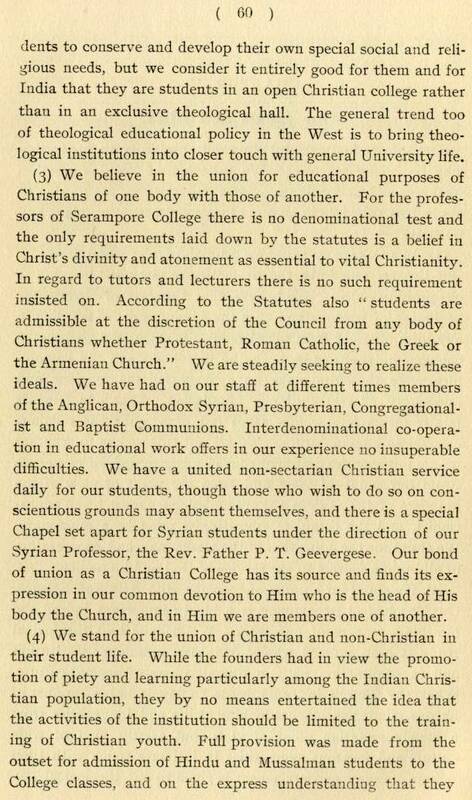 Also, the interdenominational character of the College was evident as Anglicans, Baptists, Congregationalists, Disciples, Lutherans, Methodists, Presbyterians, Syrian Orthodox, and Welsh Calvinists either enrolled or served on the faculty. 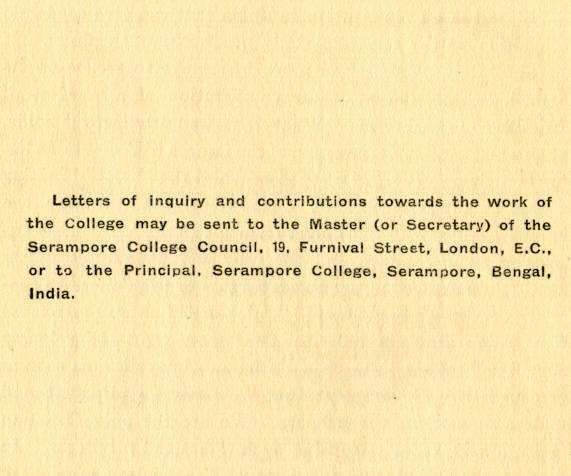 In 1969, the Indian government honored Serampore College with a national stamp and first day issue brochure. 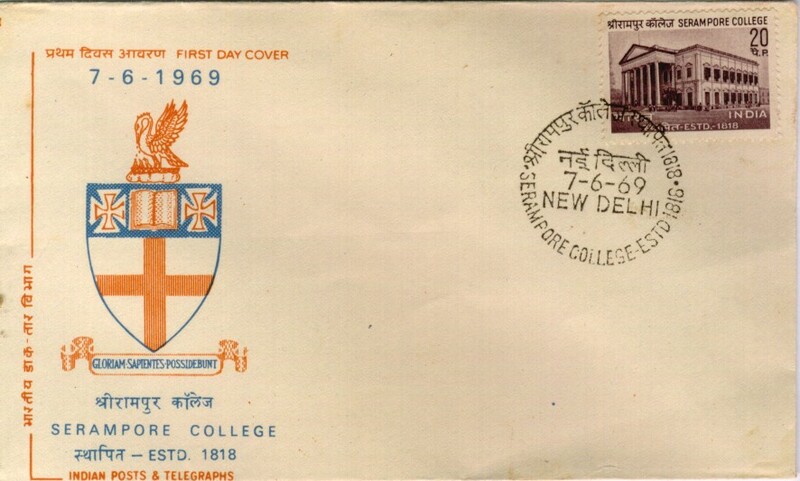 To view the Indian stamp and first day brochure, click here. 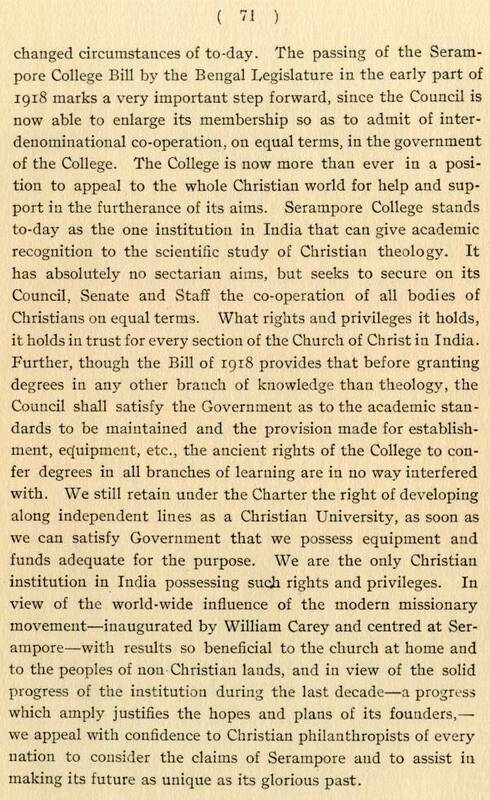 Serampore College continues its work as an institution of arts, sciences, and theology. 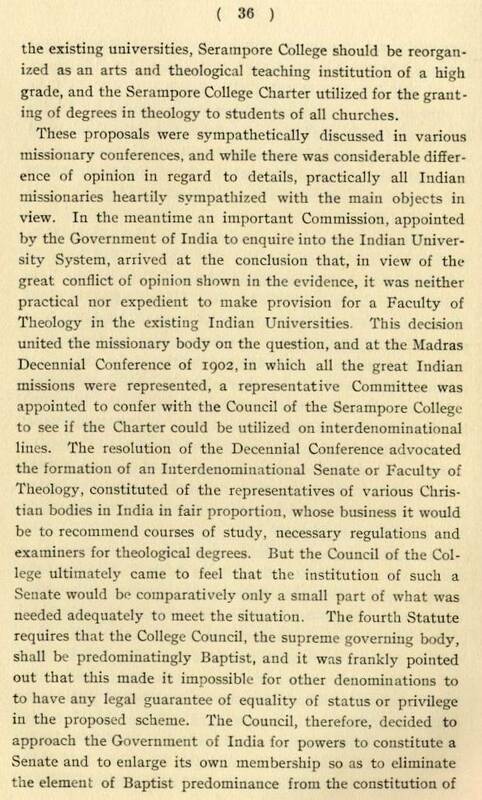 In May, 2001, the Senate of Serampore College conducted the interdenominational Indian National Consultation on Theological Education, CSI Centre, Chennai, India. 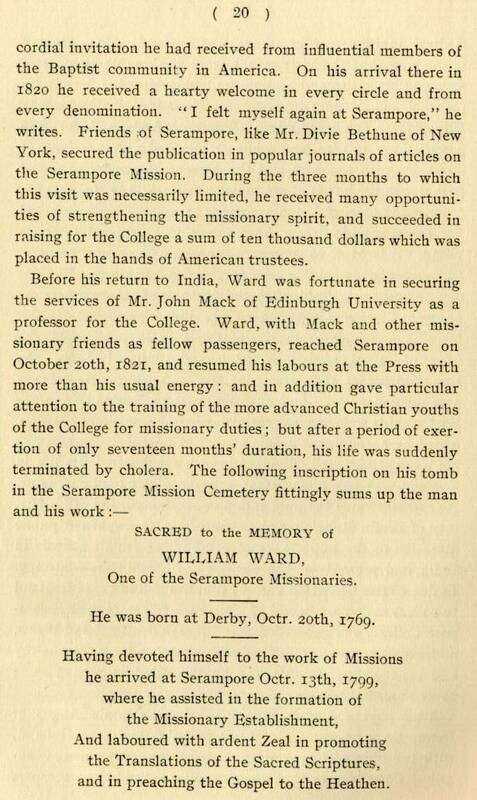 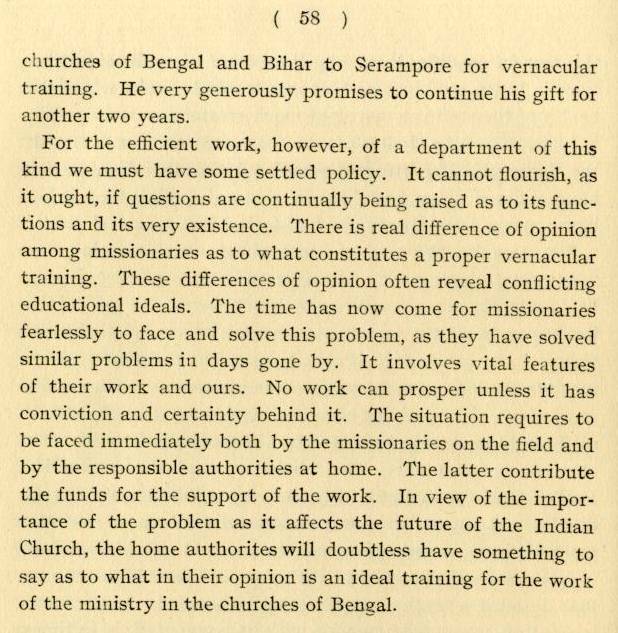 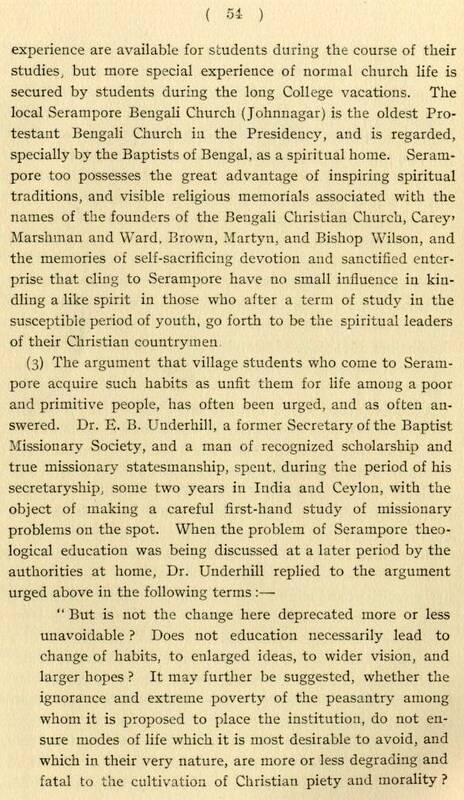 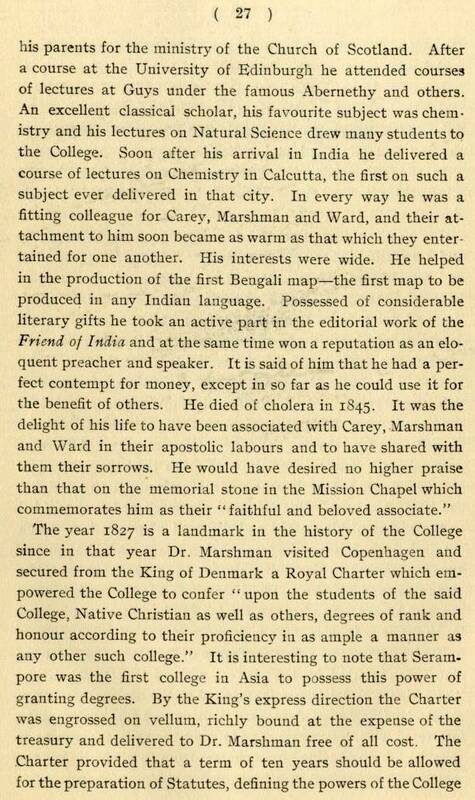 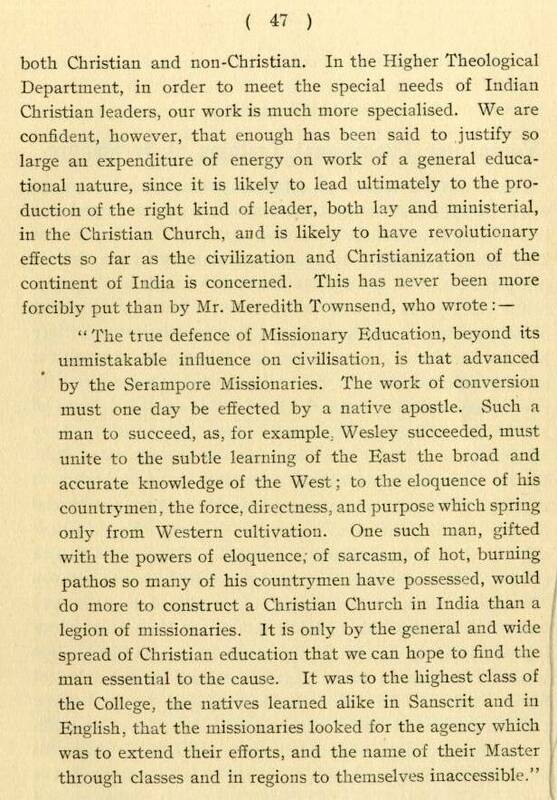 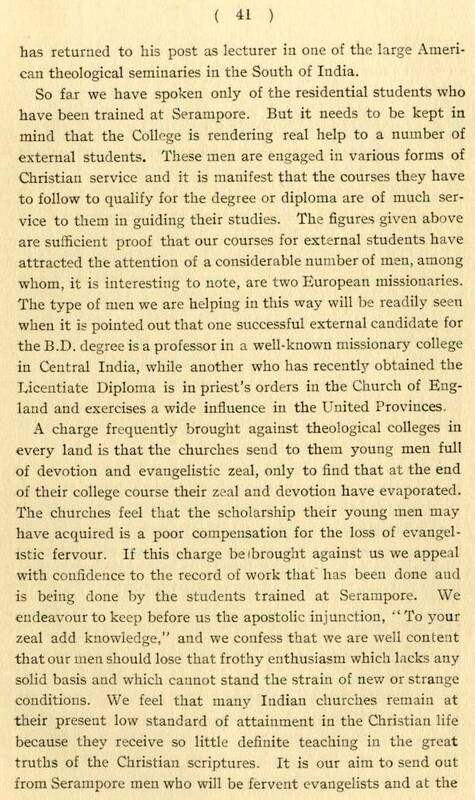 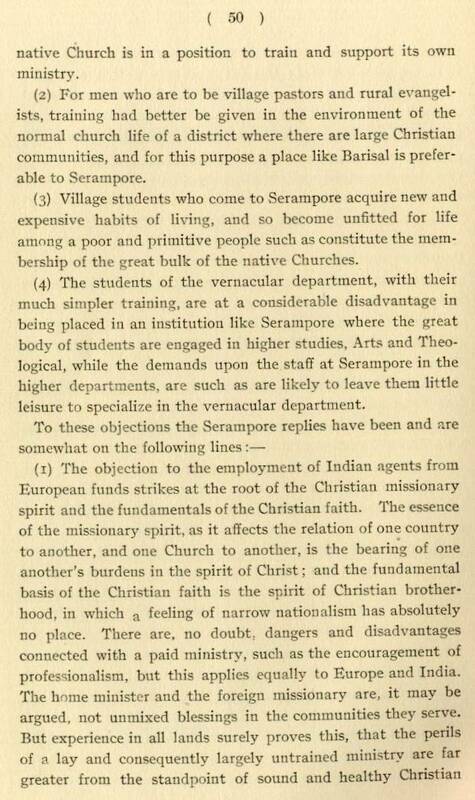 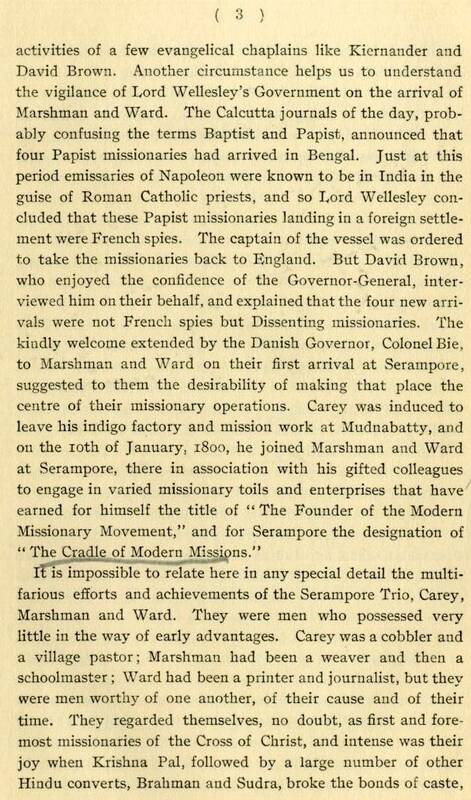 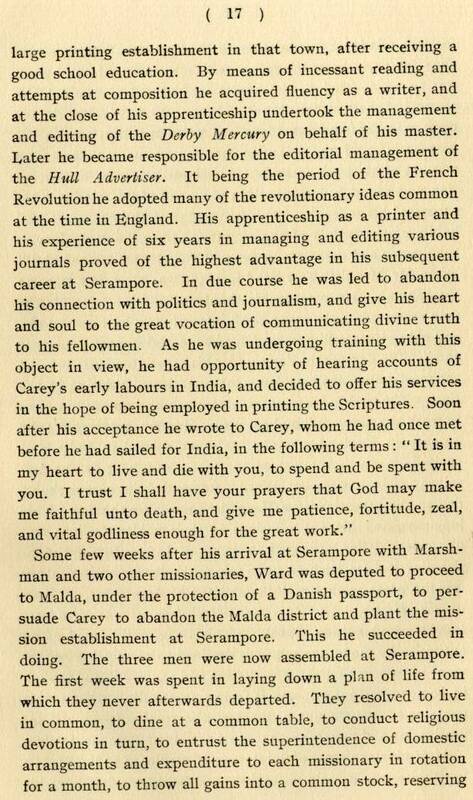 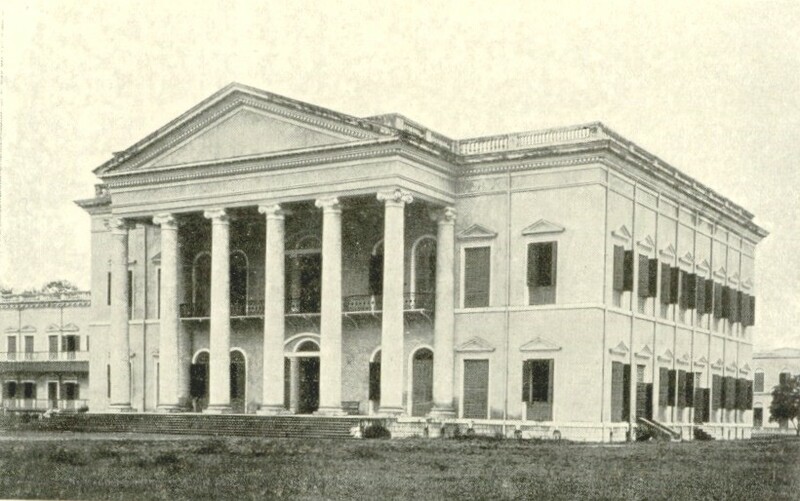 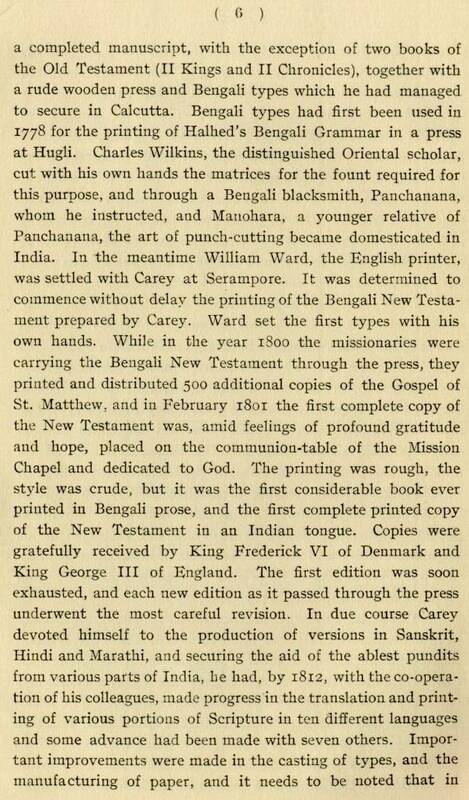 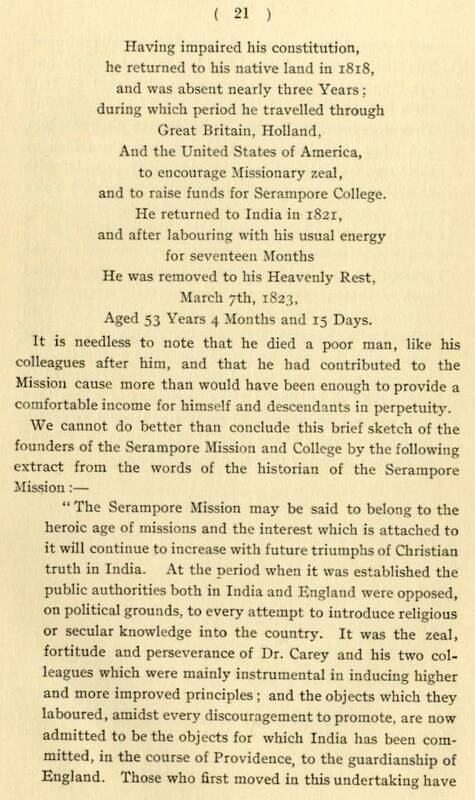 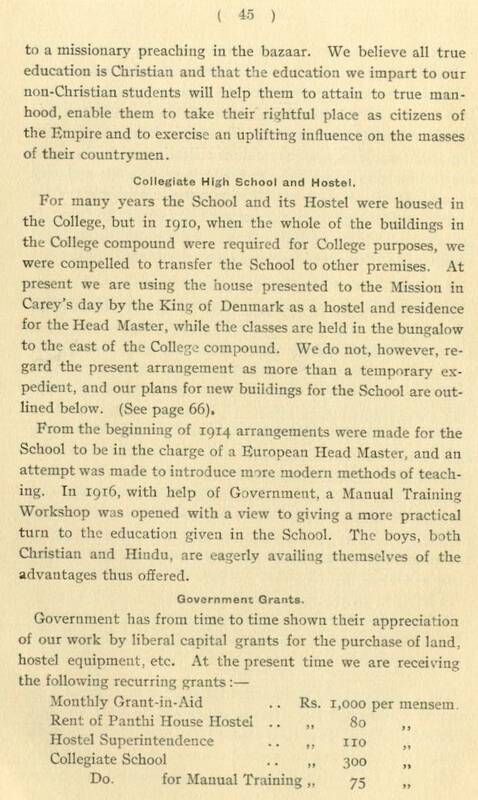 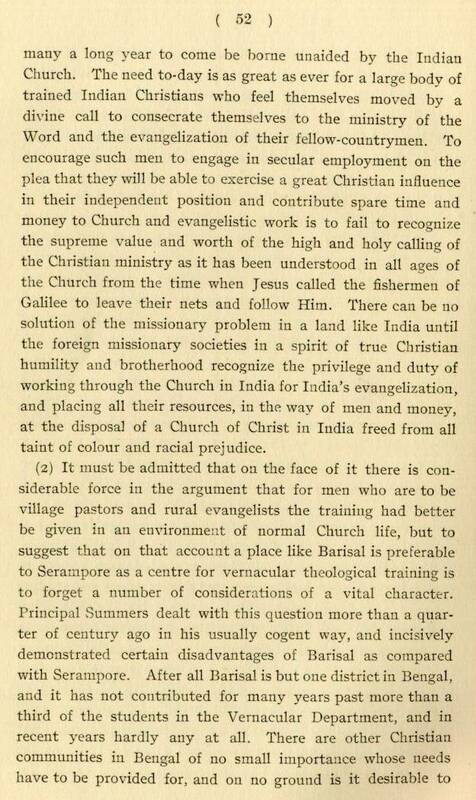 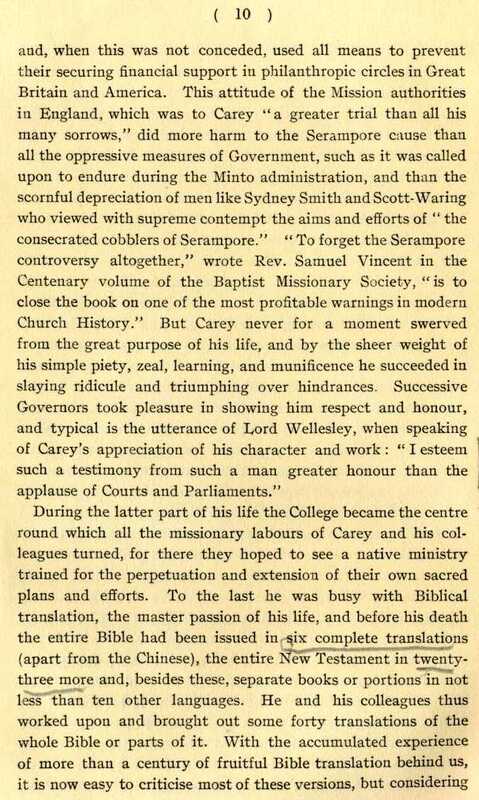 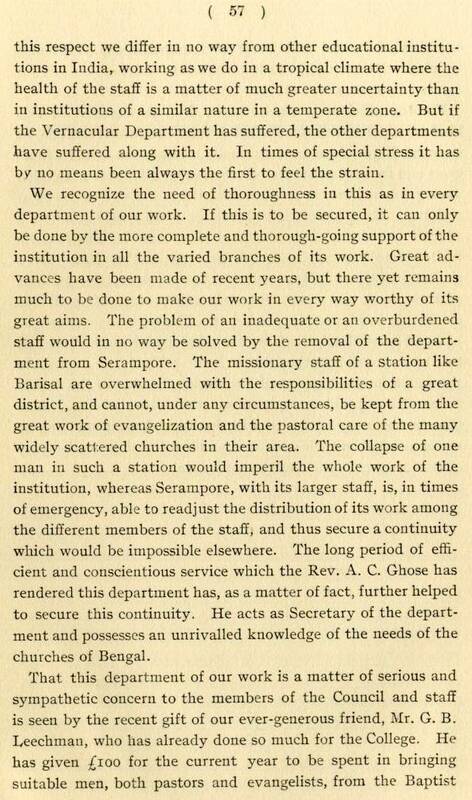 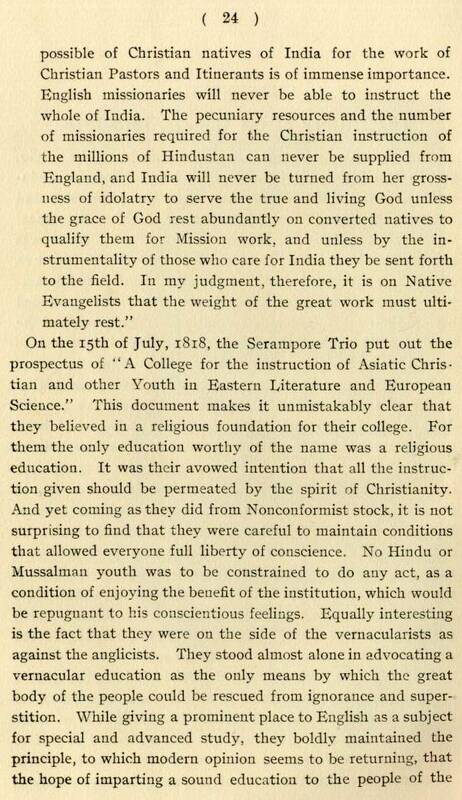 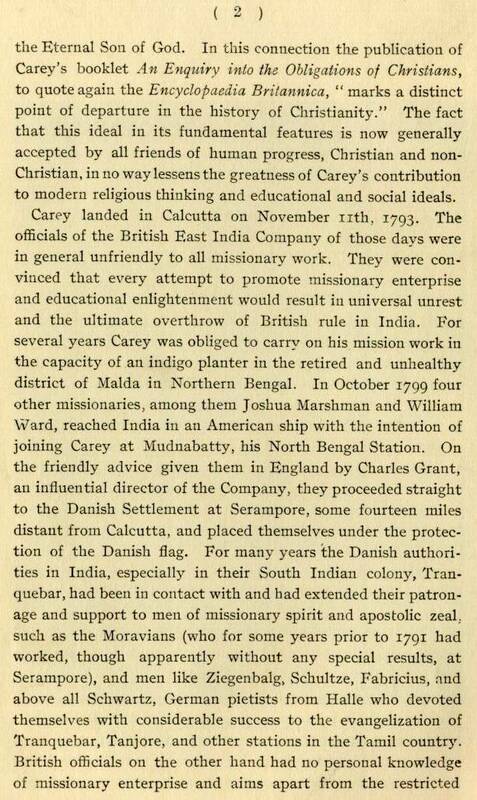 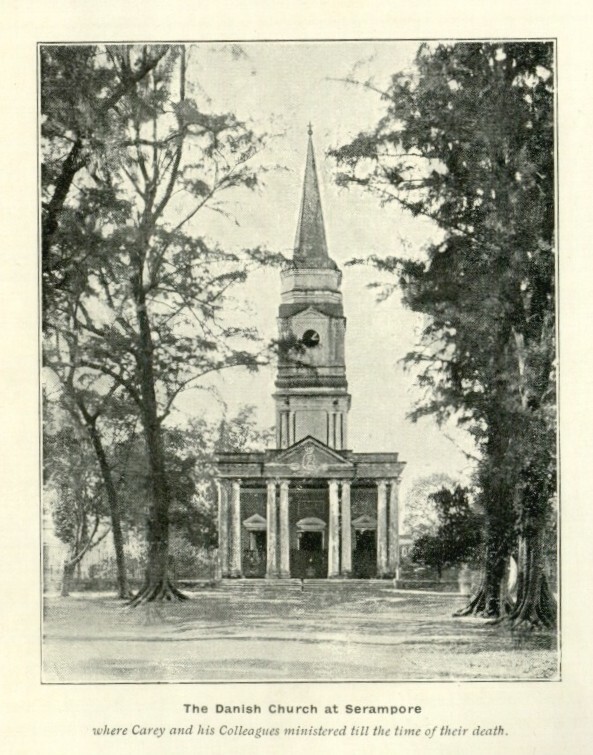 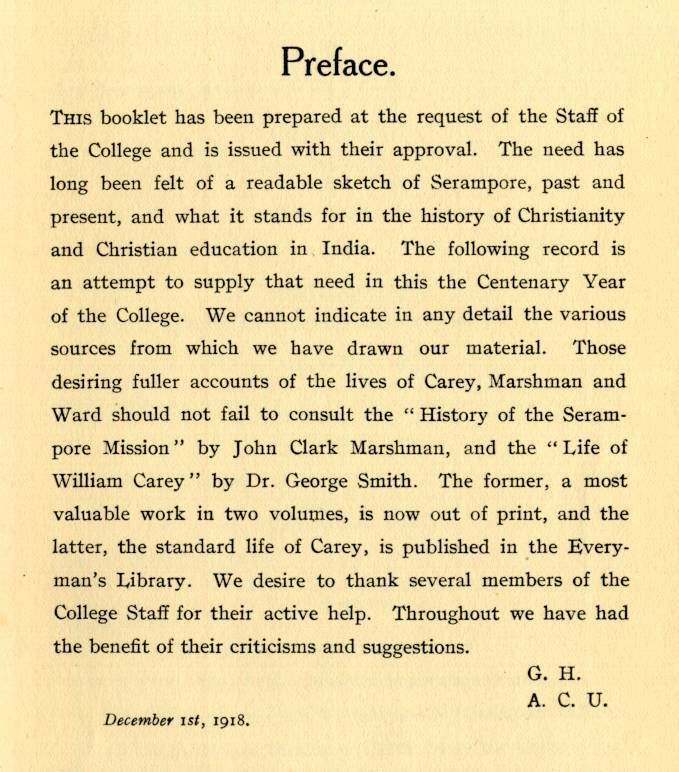 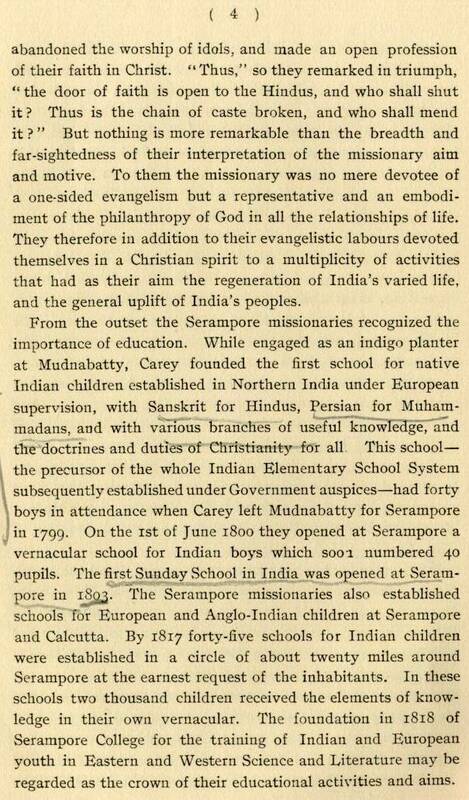 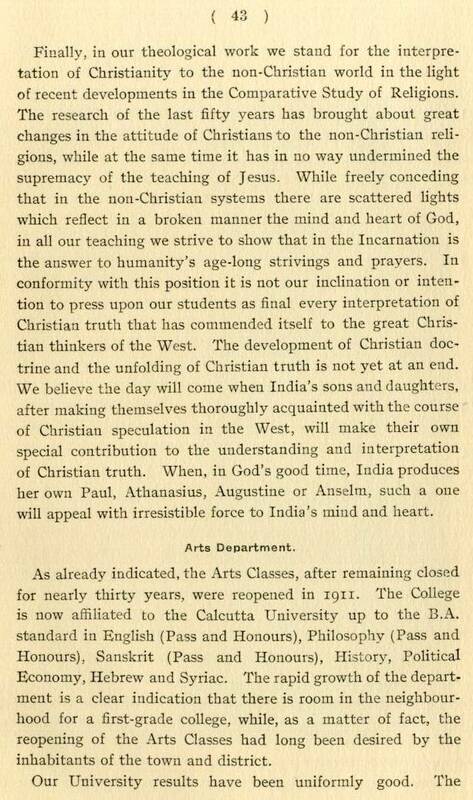 In 1918, Dr. George Howells and A. C. Underwood wrote The Story of Serampore and its College (Serampore and Calcutta: Baptist Mission Press, 1918), a brief history of the College. 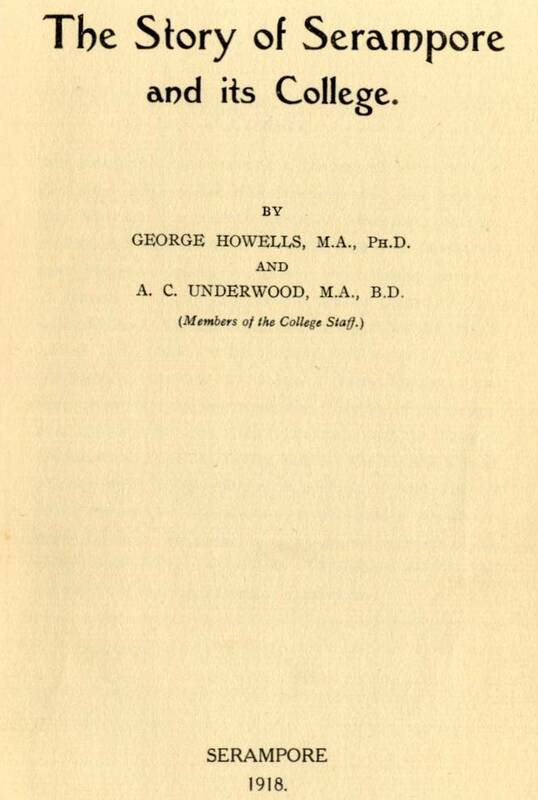 At the time of the book's composition, Dr. Howells was the Principal of the College, and Rev. 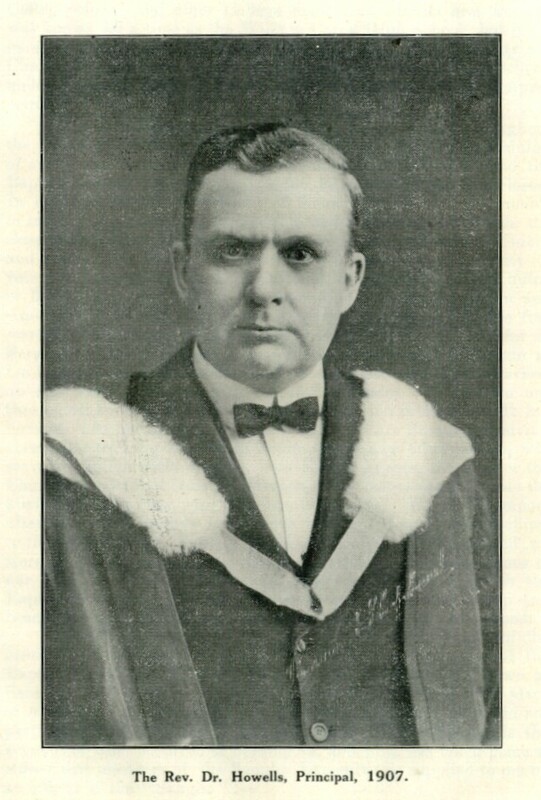 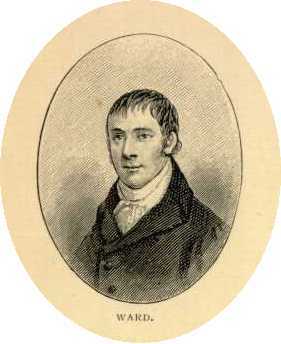 Underwood served as Bursar and Librarian of the College. 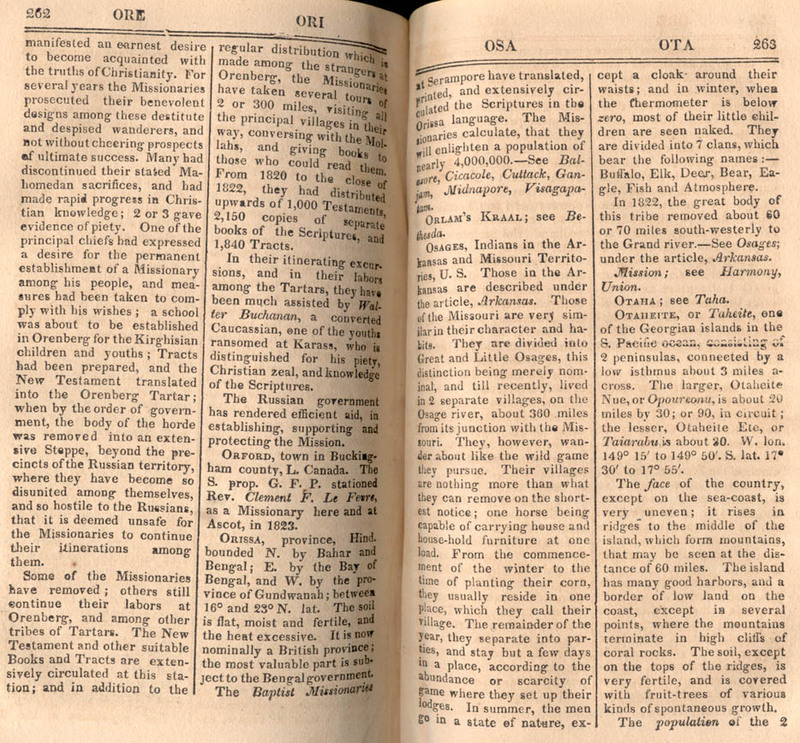 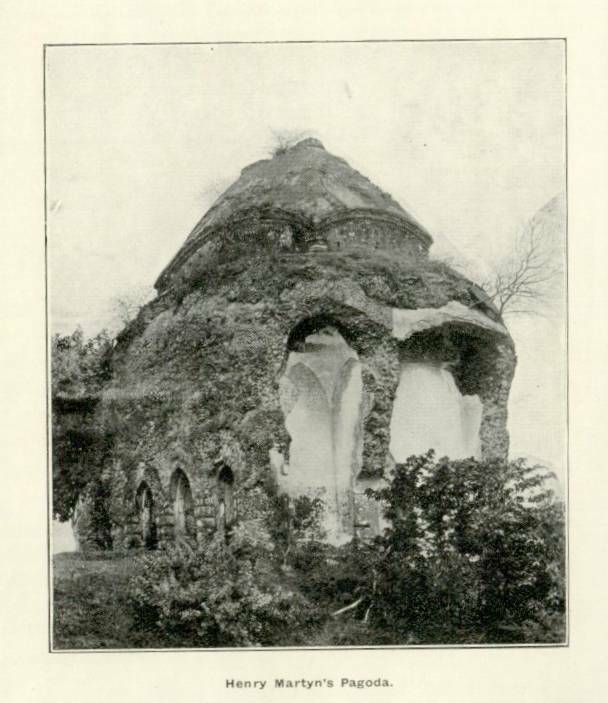 Below are links to the full text images of the book. 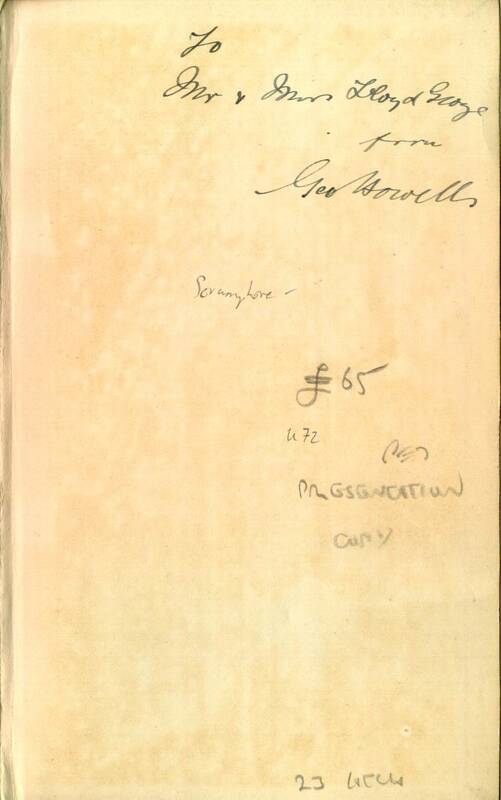 The Center's copy of this book was signed by Dr. Howells as a gift to David Lloyd George (1863-1945) who served as the British Prime Minister, 1916-1922. 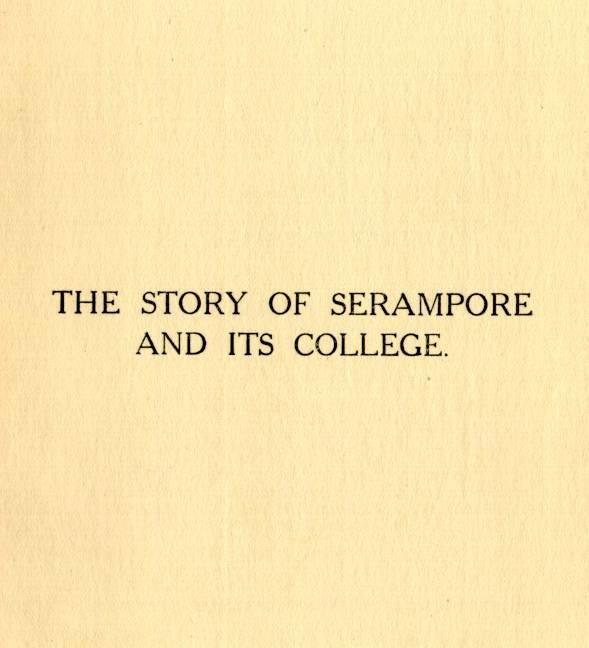 The background image on this page is Serampore College's crest, which appears on the cover of the book and on the first day issue stamp. 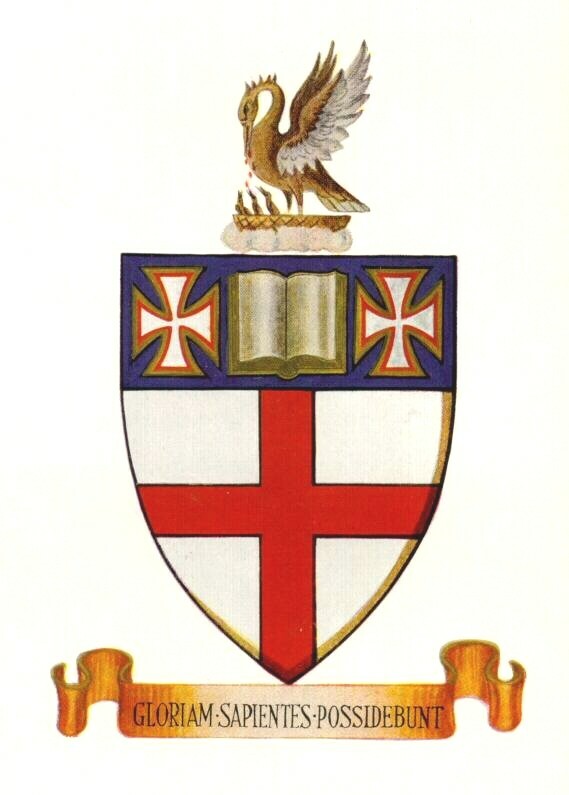 The Latin motto on the crest, GLORIAM SAPIENTES POSSIDEBUNT, could be translated as "The wise will possess glory." 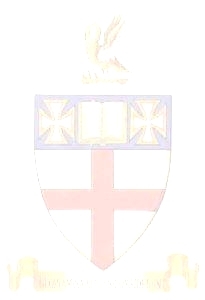 For a full blazon (i.e., interpretation) of the crest, click here. 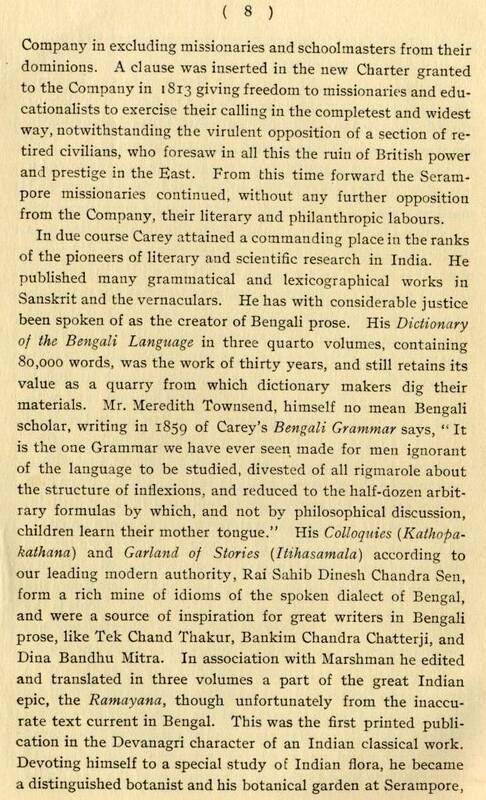 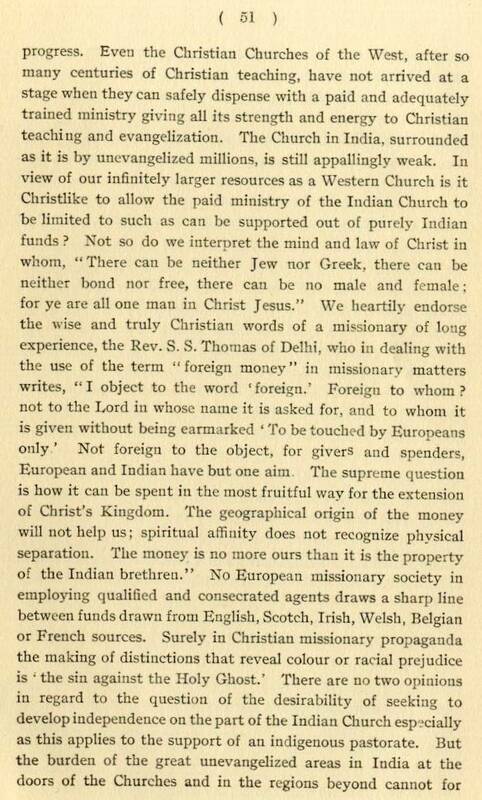 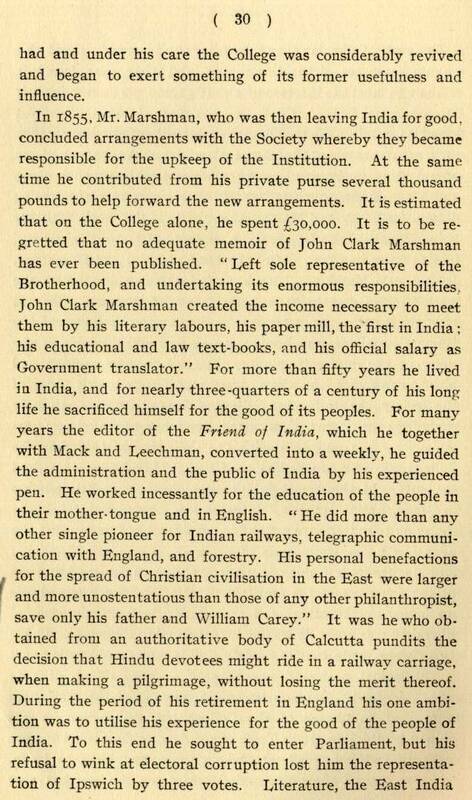 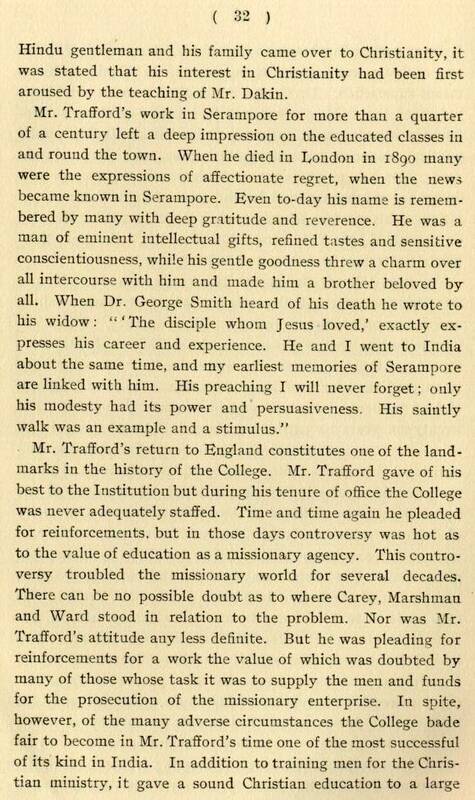 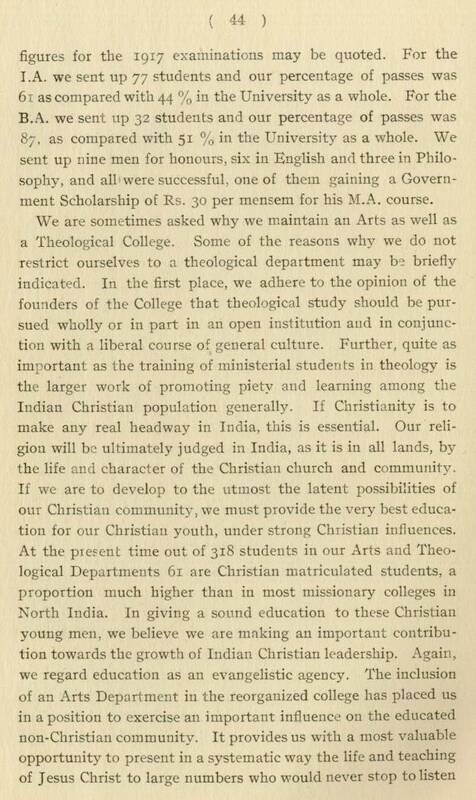 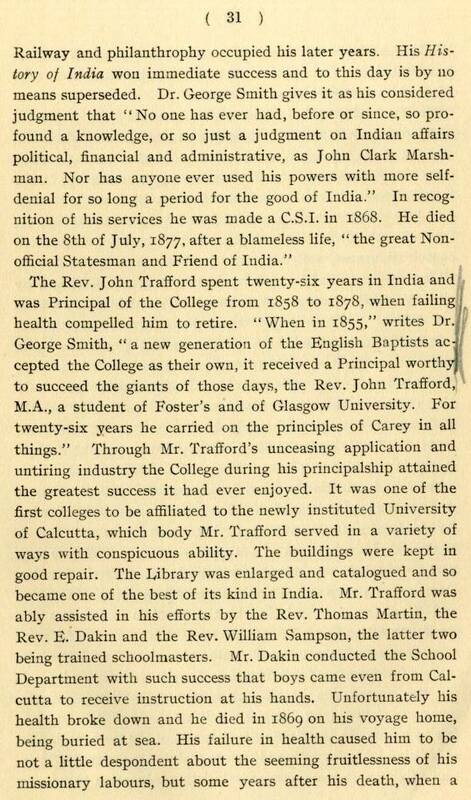 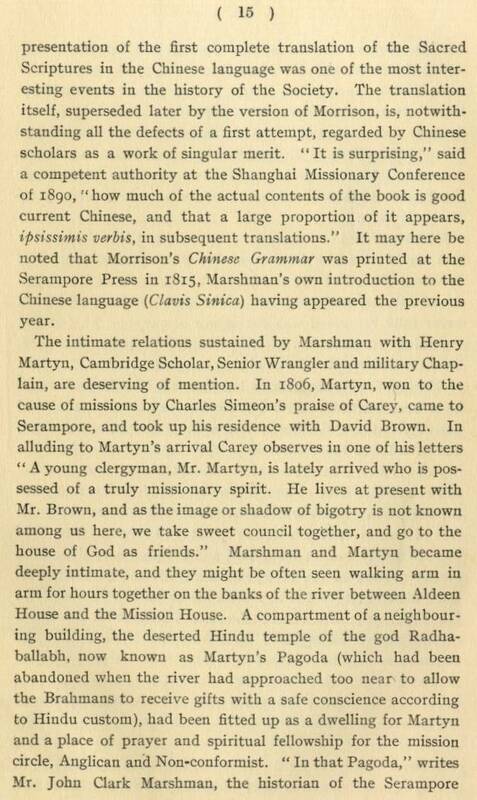 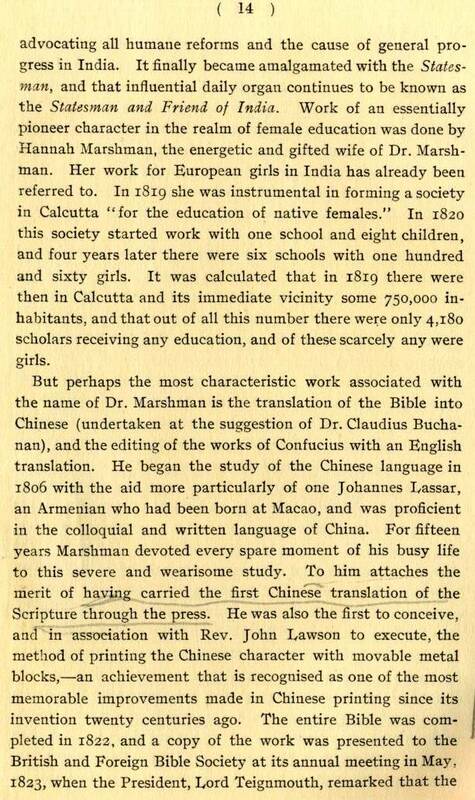 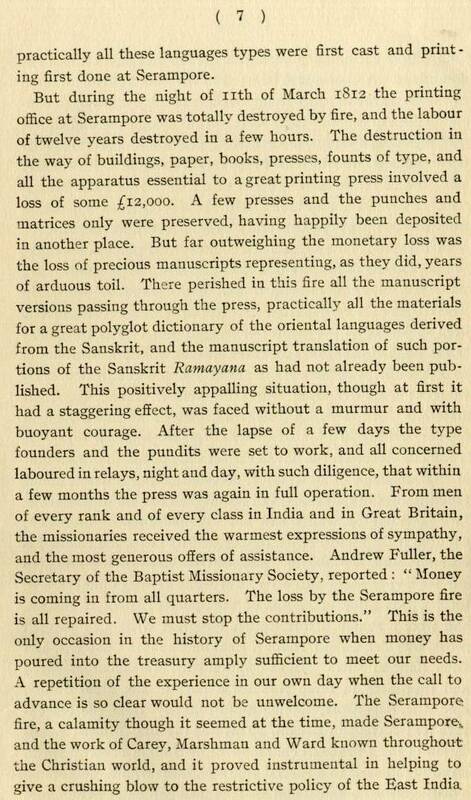 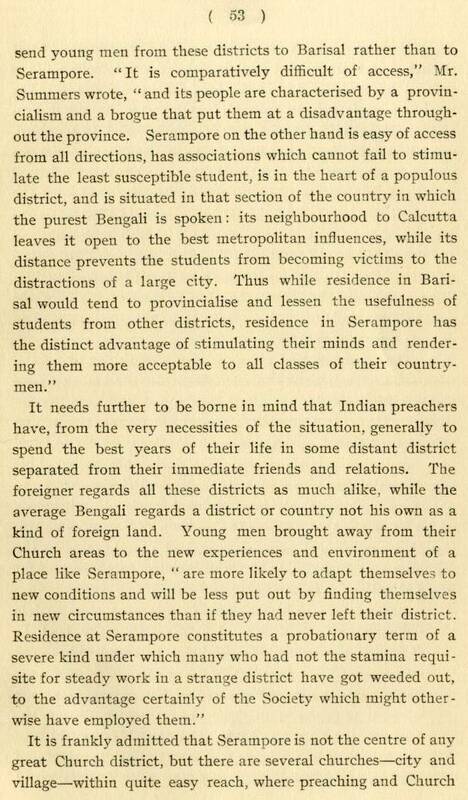 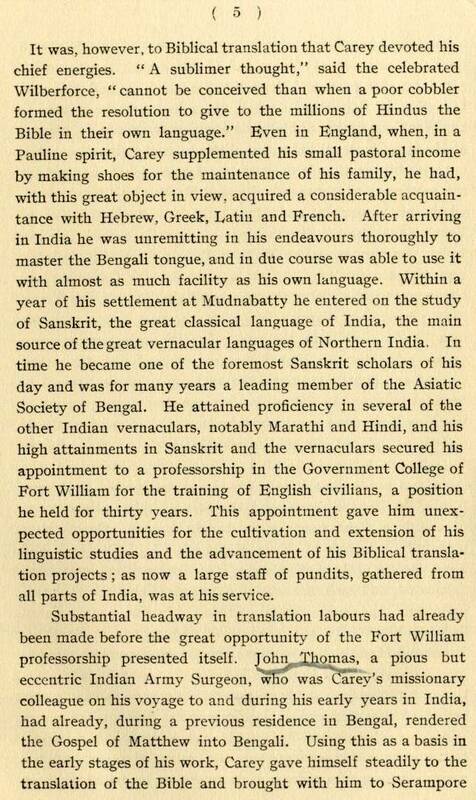 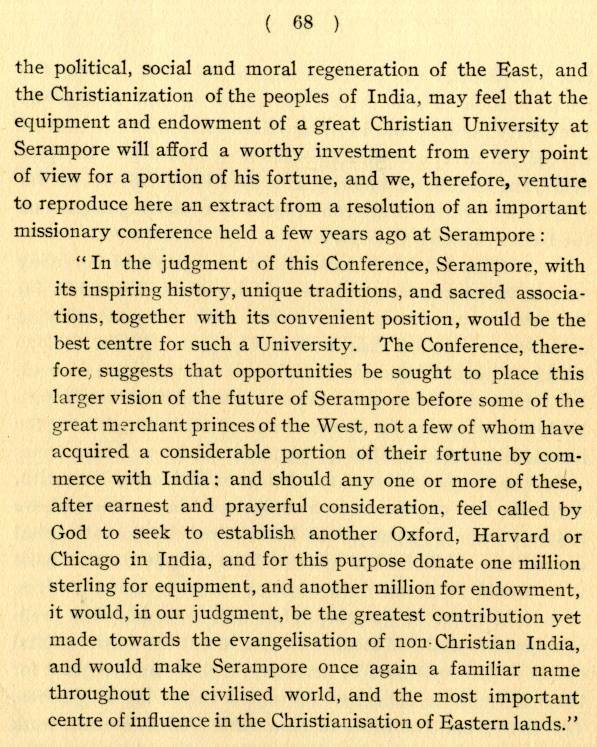 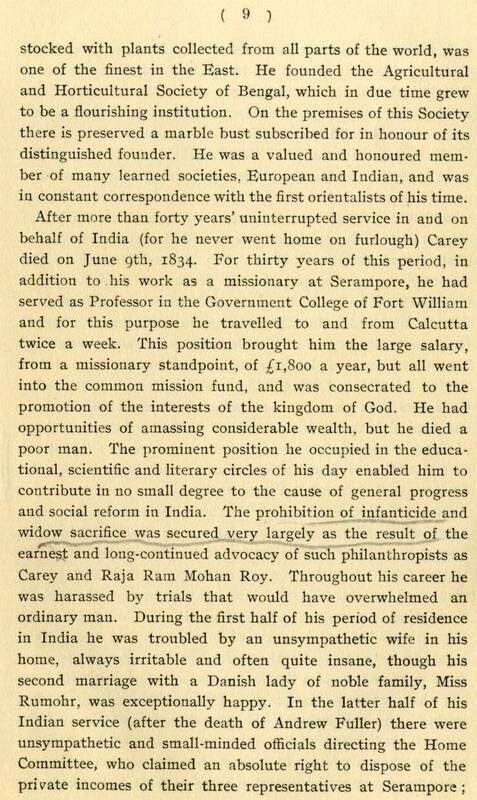 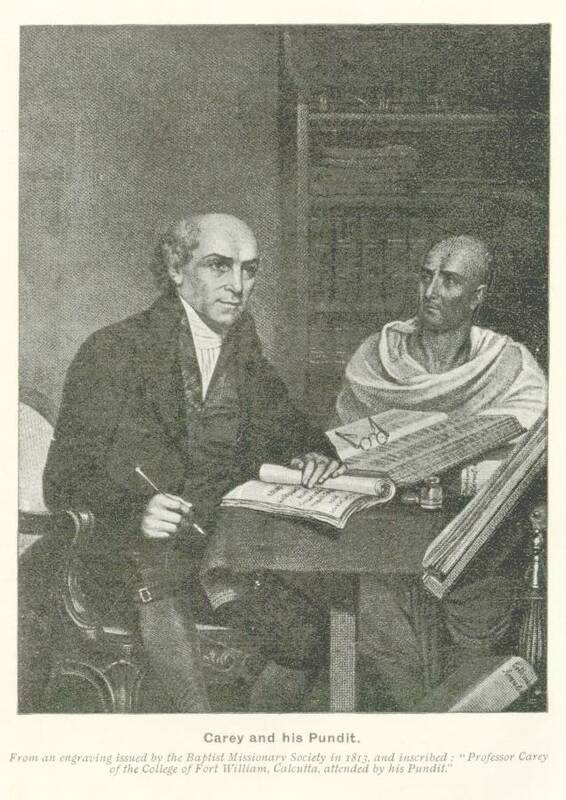 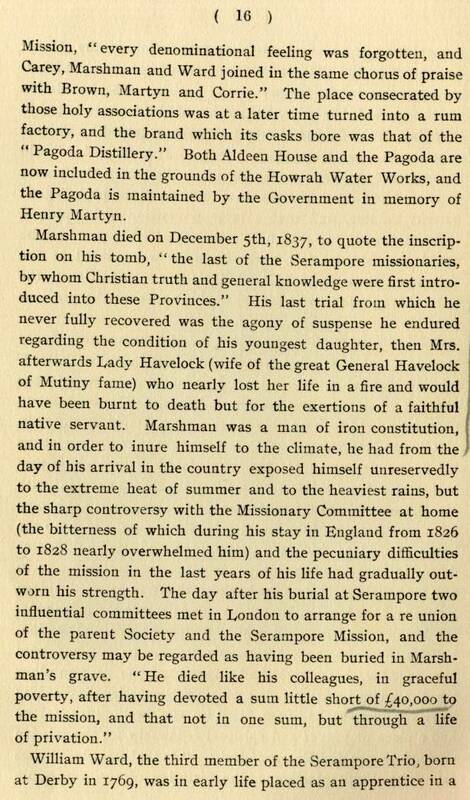 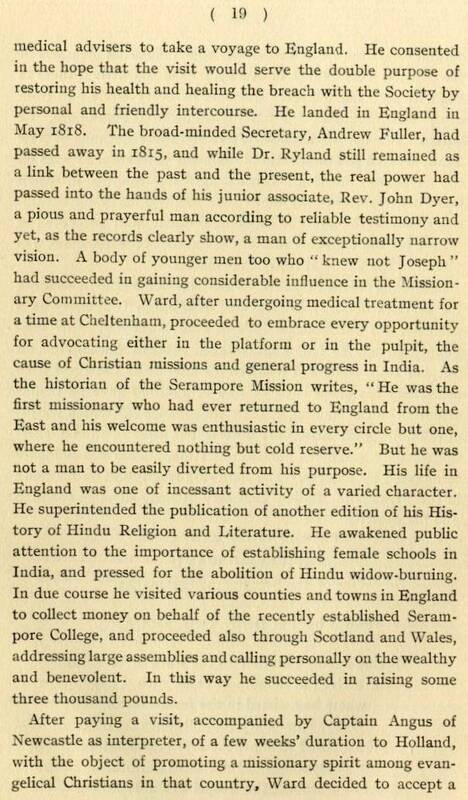 George Howells and A. C. Underwood, The Story of Serampore and its College (Serampore and Calcutta: Baptist Mission Press, 1918). 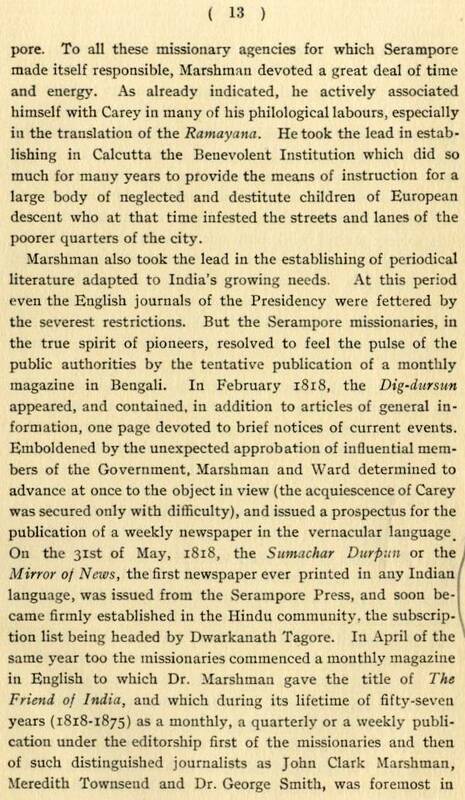 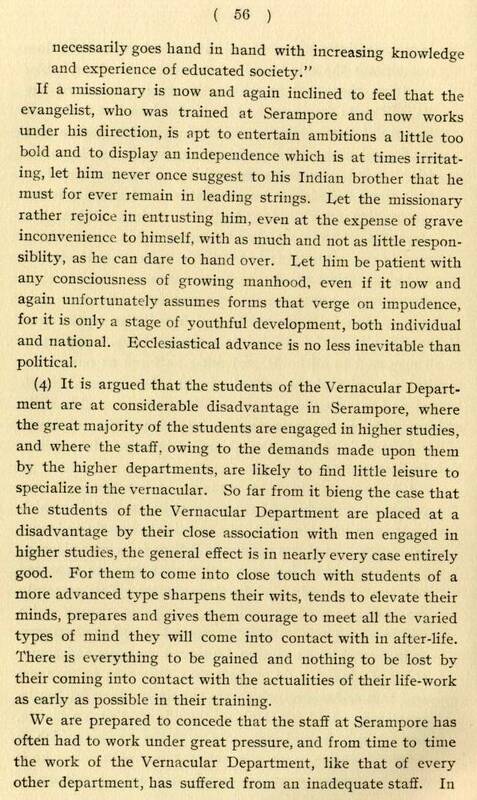 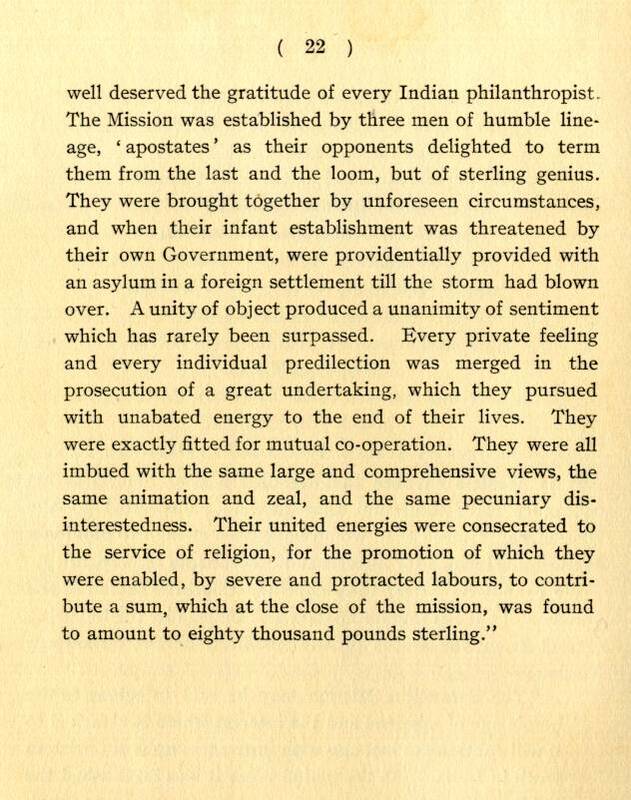 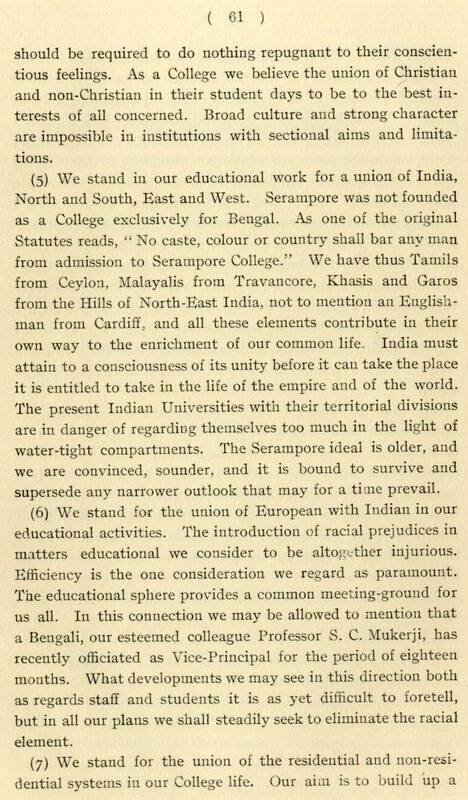 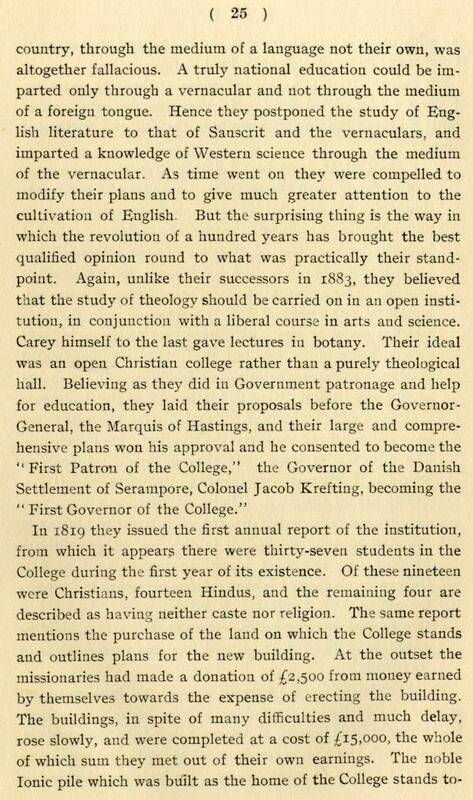 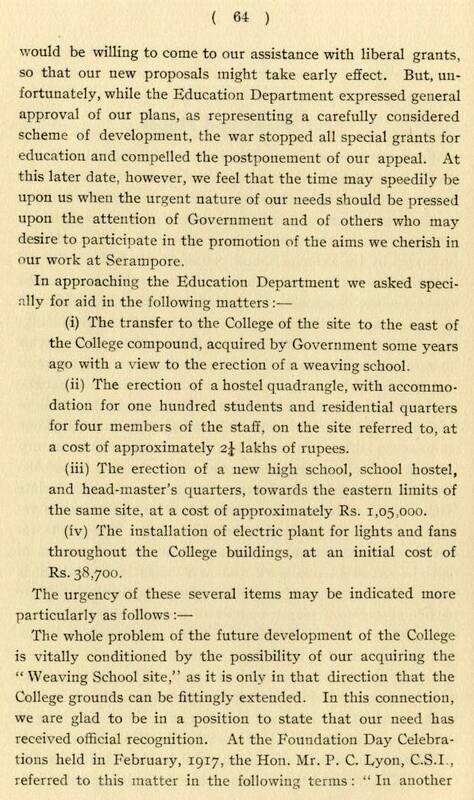 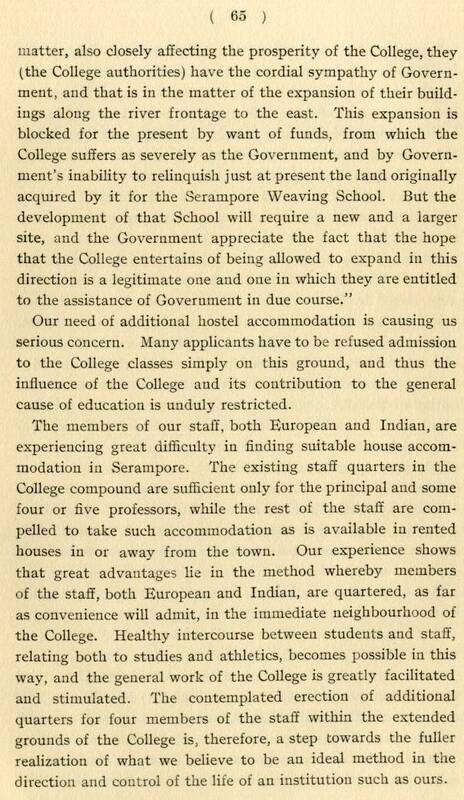 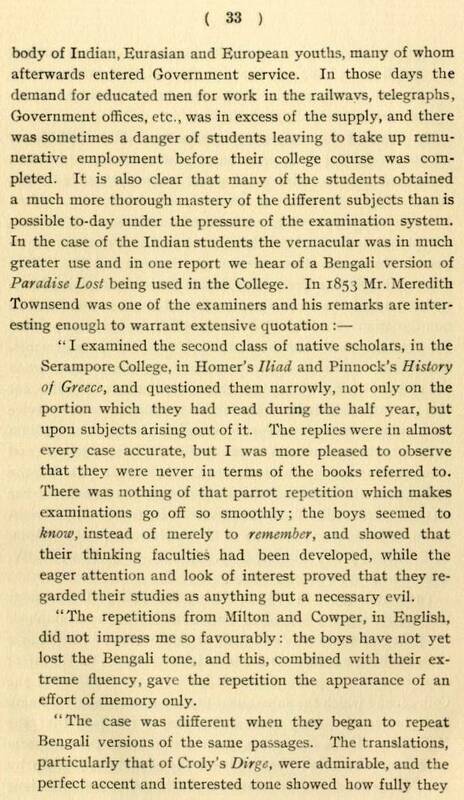 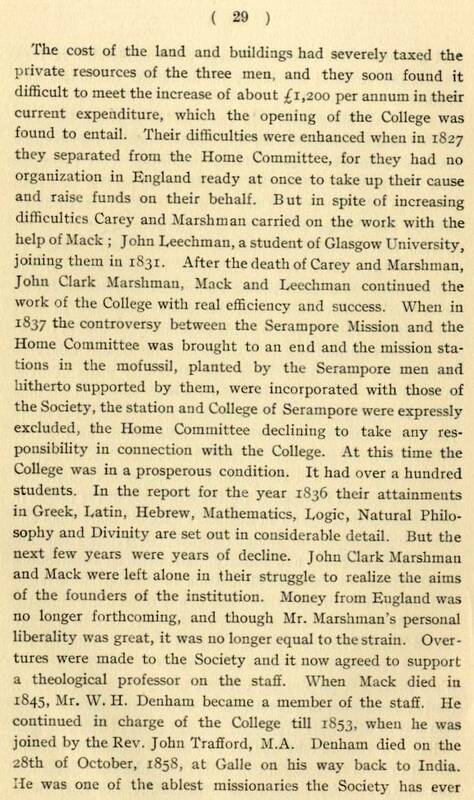 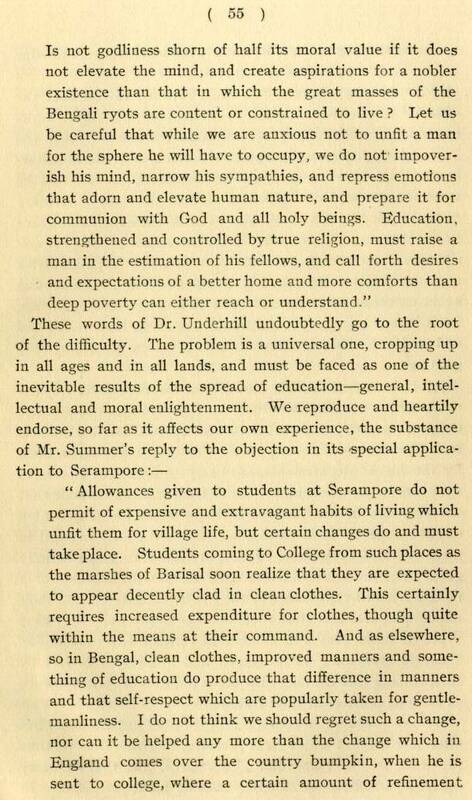 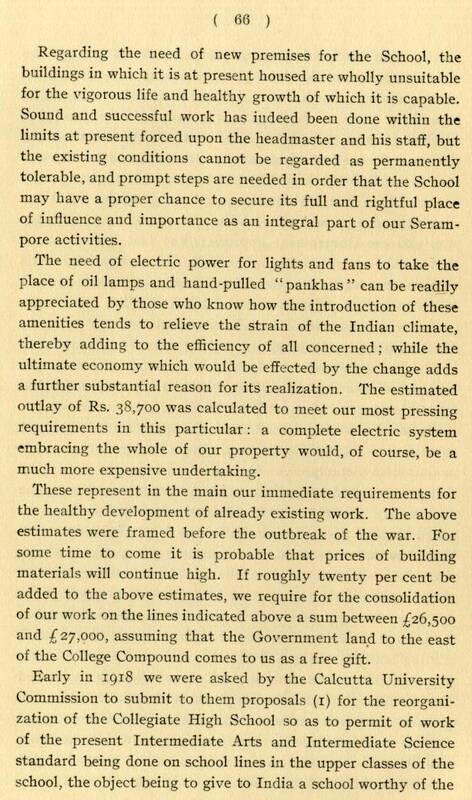 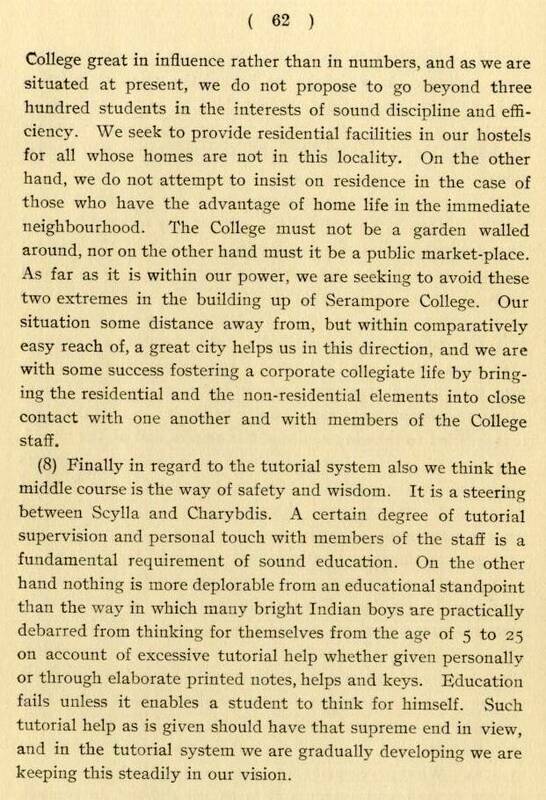 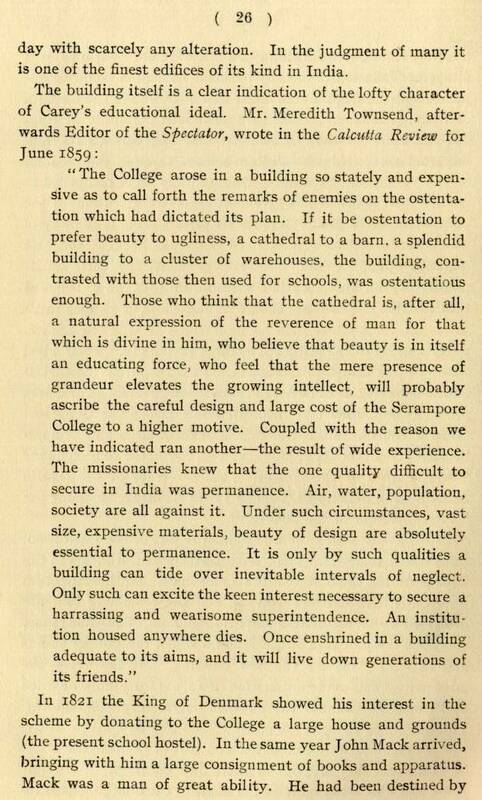 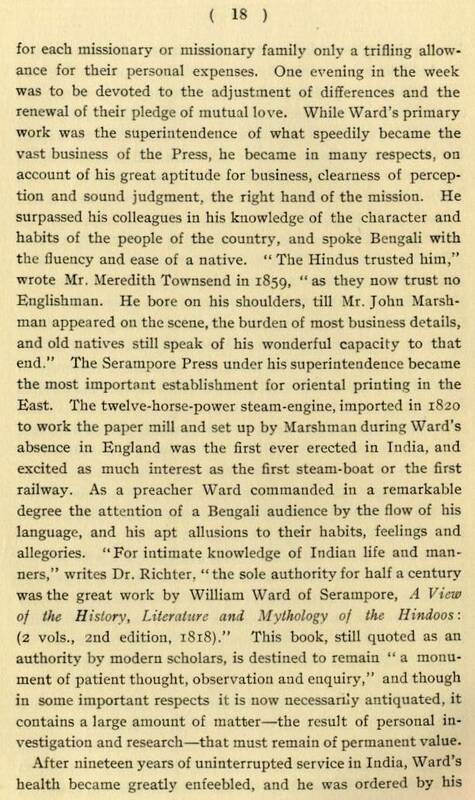 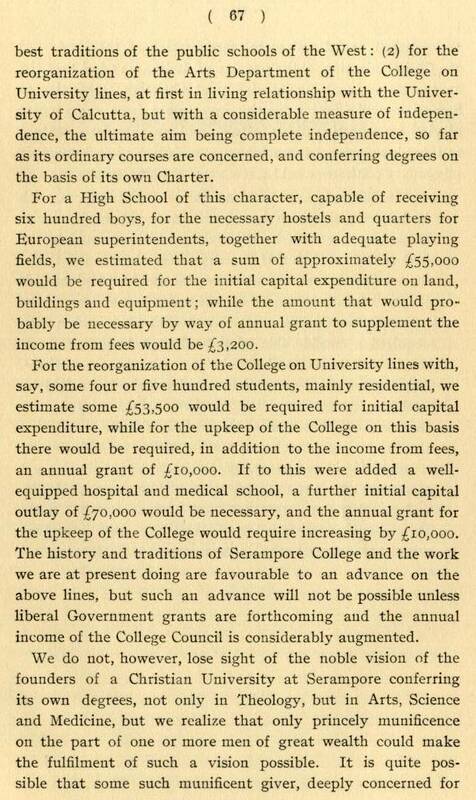 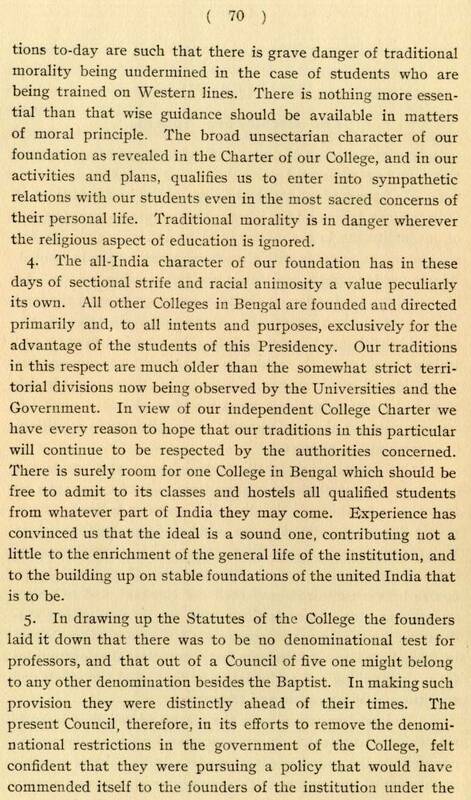 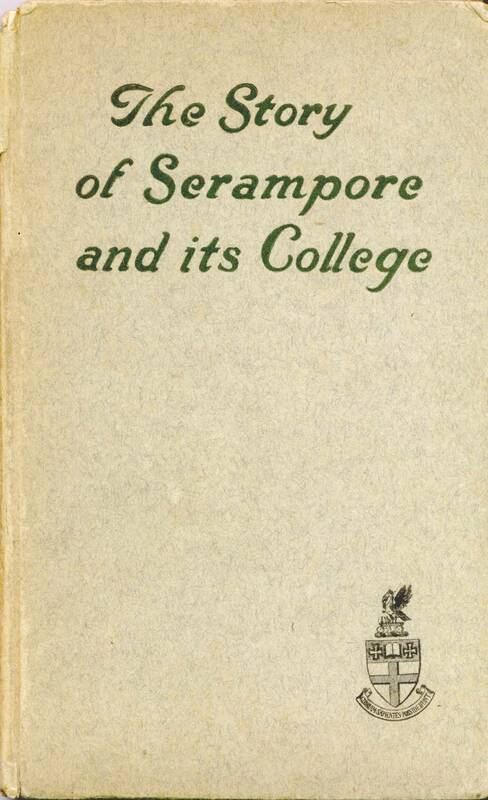 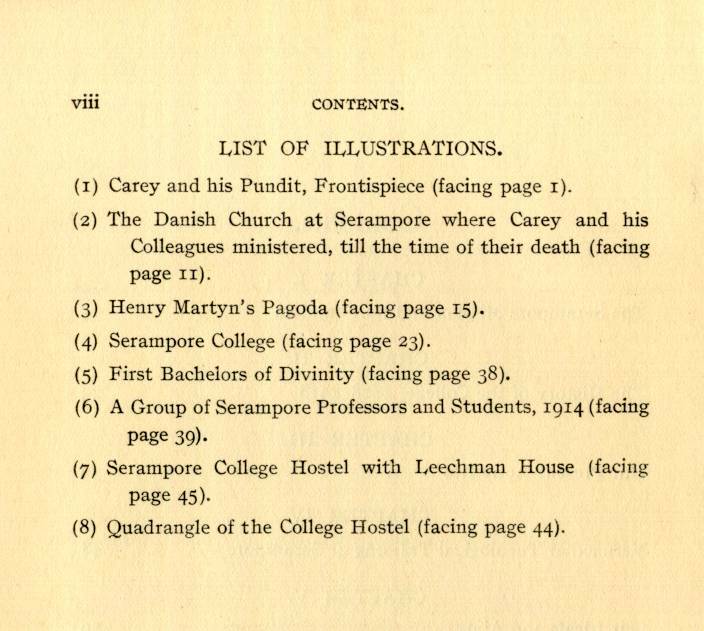 The Story of Serampore and Its College (Serampore: The Council of Serampore College, 1961). 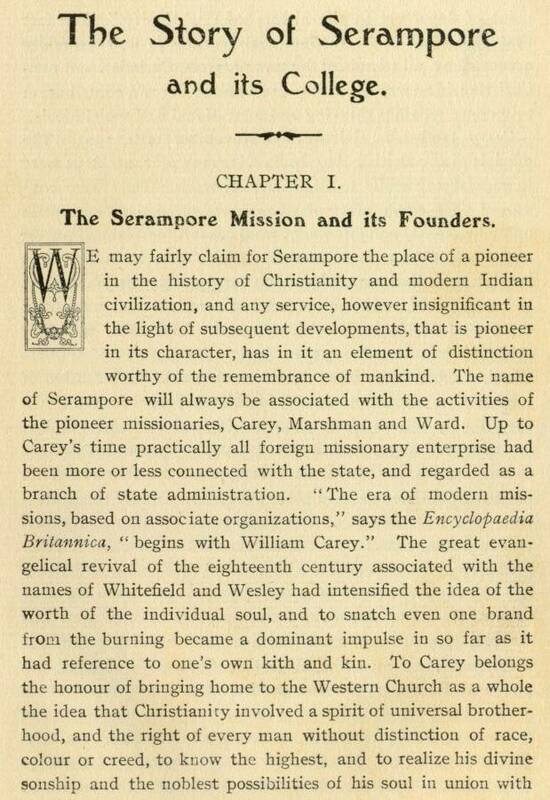 On March 21, 2005, Dr. Lalchungnunga, Principal, Serampore College, was William Carey College's Jubilee Lecturer. 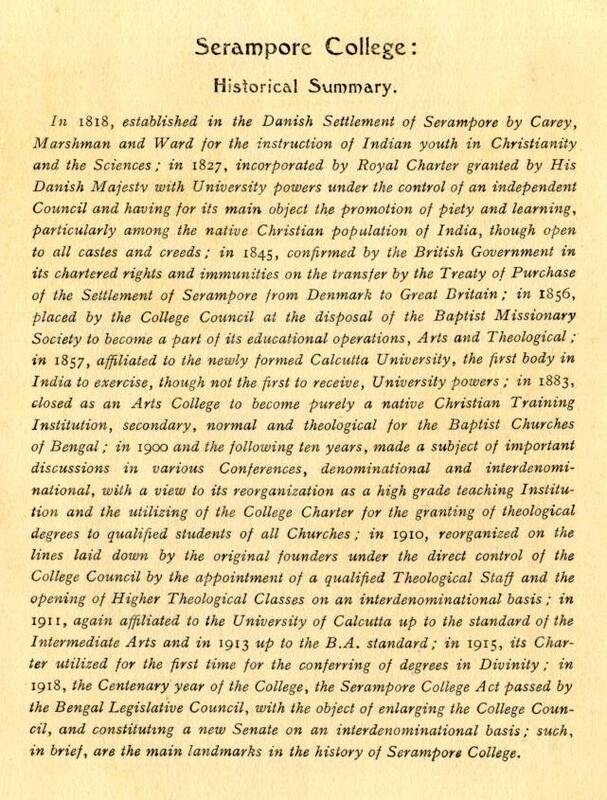 Dr. Lalchungnunga presented William Carey College an English text replica of Serampore College's charter. 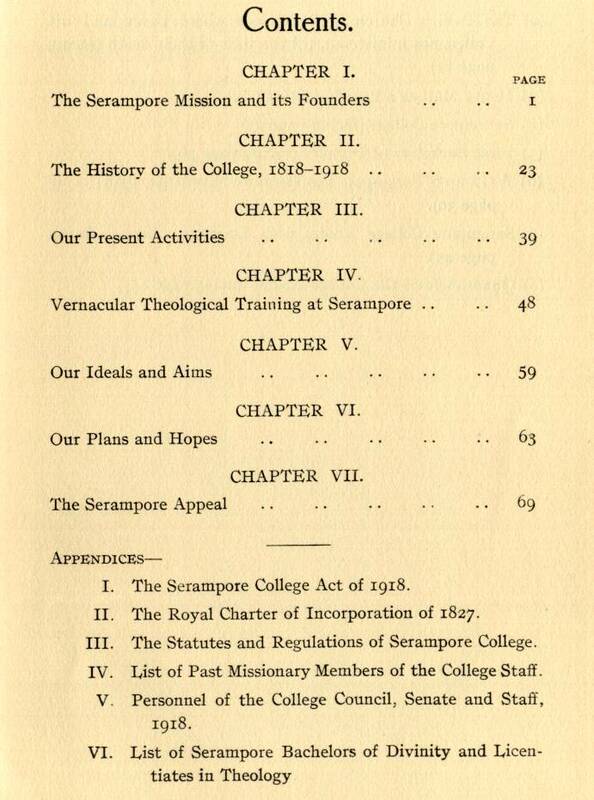 Below are links to this special gift from Serampore College. 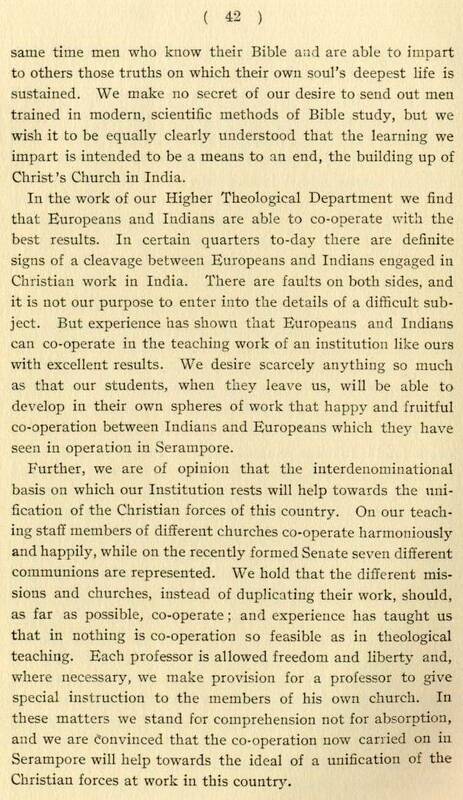 Ravi Tiwari, "Reconfiguring Theological Education in India," New Life Theological Journal 7, no. 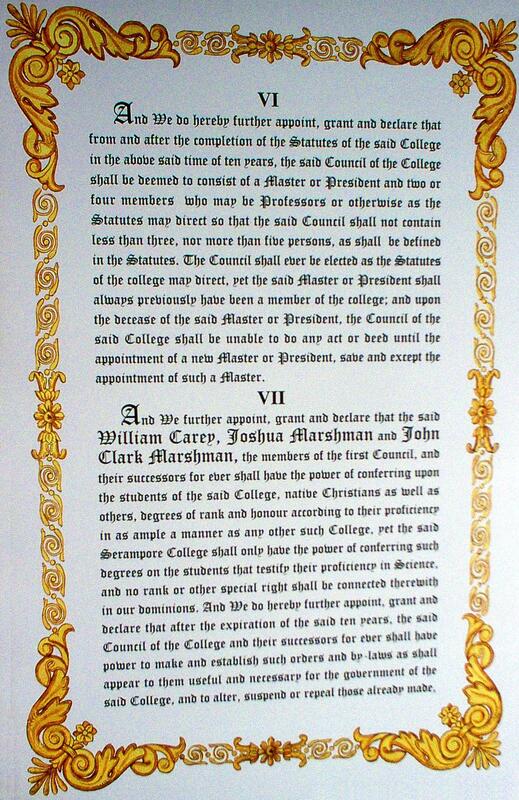 7 (January-June 2017): 7-23.